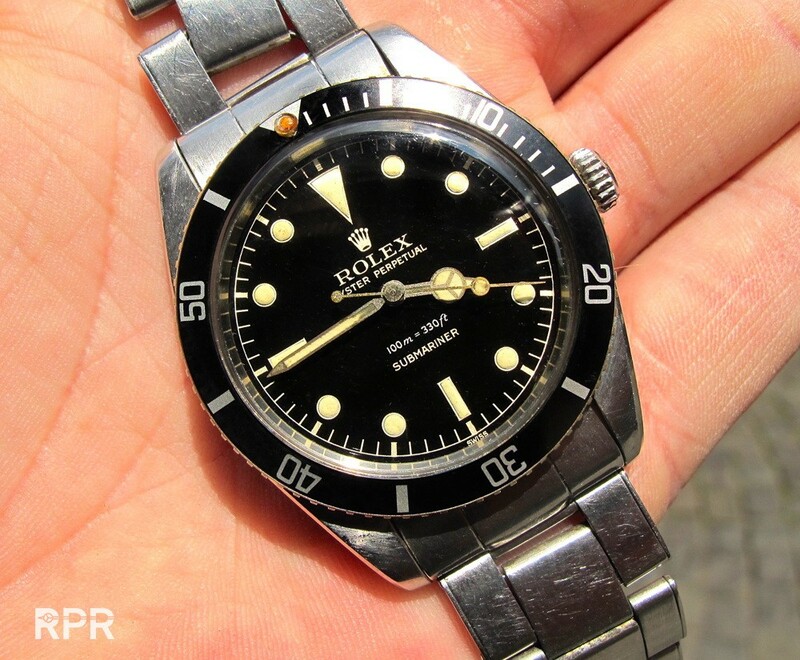 A lot has already been written about the impact of the luminous used in wristwatches. 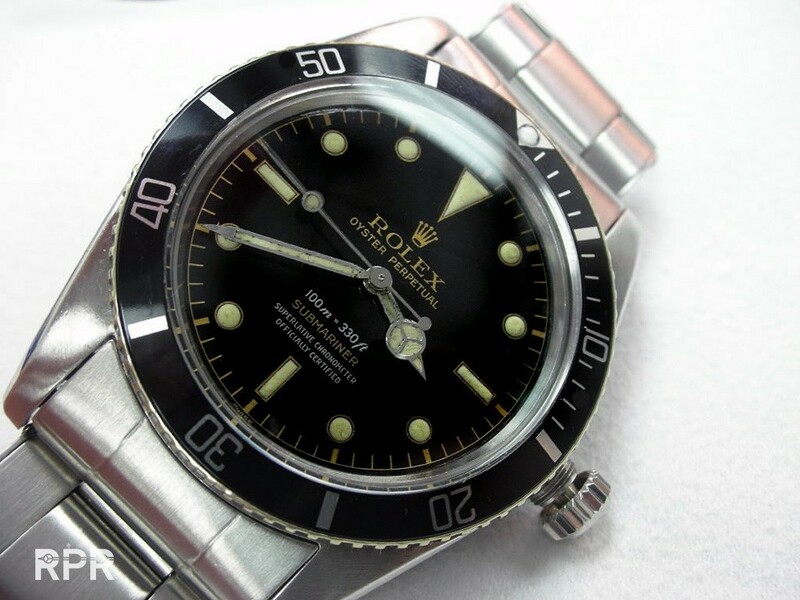 In specific the turn from using radium to tritium has been discussed in length on vintage Rolex Forums. 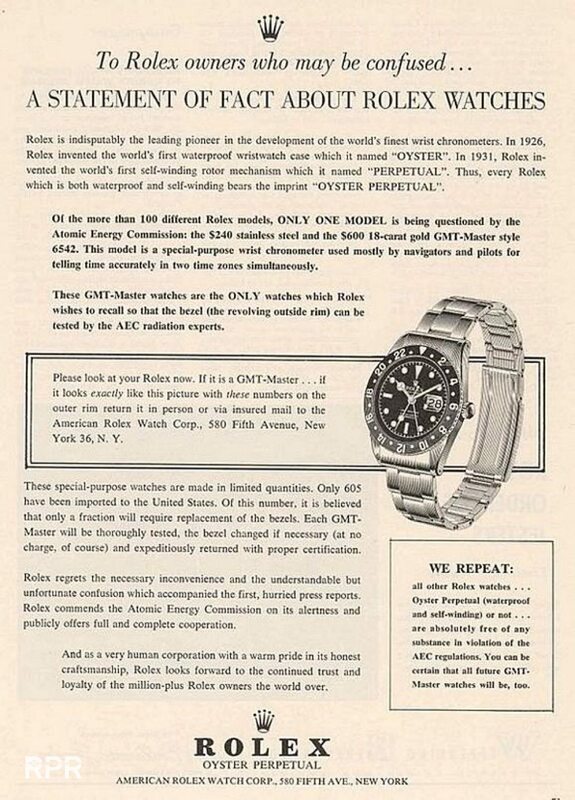 Today I don’t want to debate the dangers of early radium nor the legal impact radiation had for the swiss watch companies. 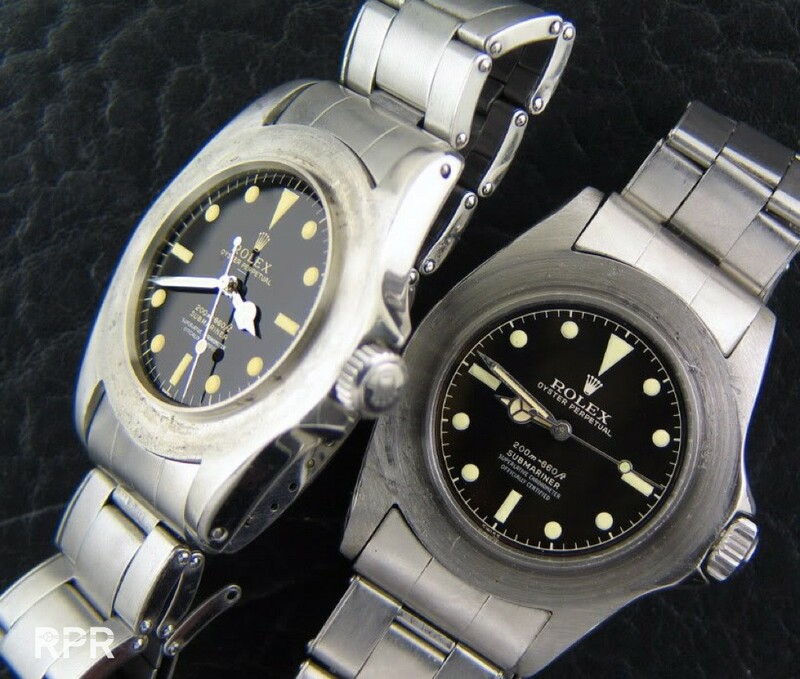 I merely want to make a general overview that’s useful for Rolex collectors to understand the differences of luminous, their used time period, the influence it had on the condition of the dial and what typical details one has to look for when analyzing a vintage Rolex. 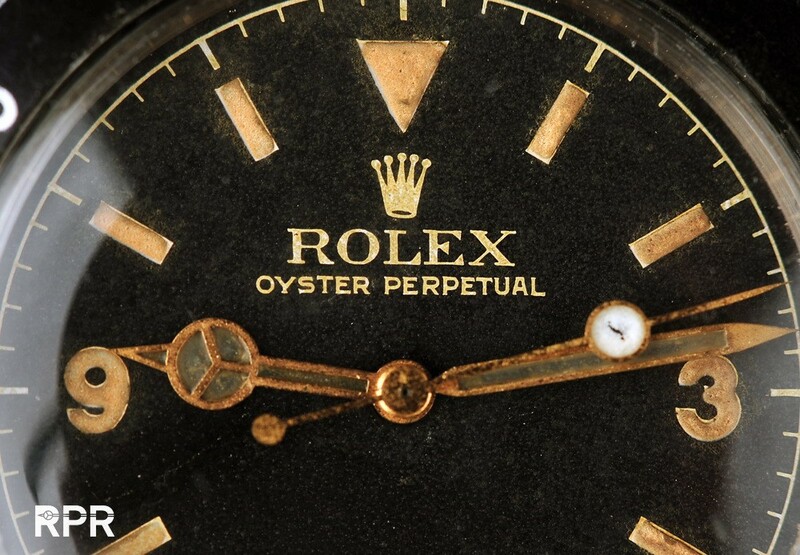 Prior – 1953, The early age of Rolex luminous, used on their pocket watches, early oyster cases, bubble backs and radiomir Panerai’s. 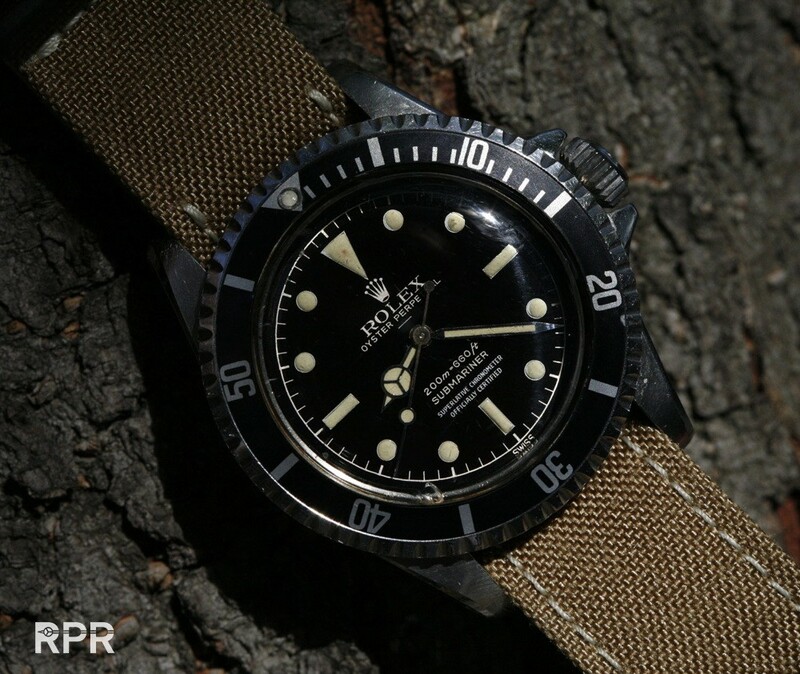 1953 – 1956, When Rolex introduced the world their sports / utility / tool watch concept with radium Submariner, TOG, Explorer & GMT Master. 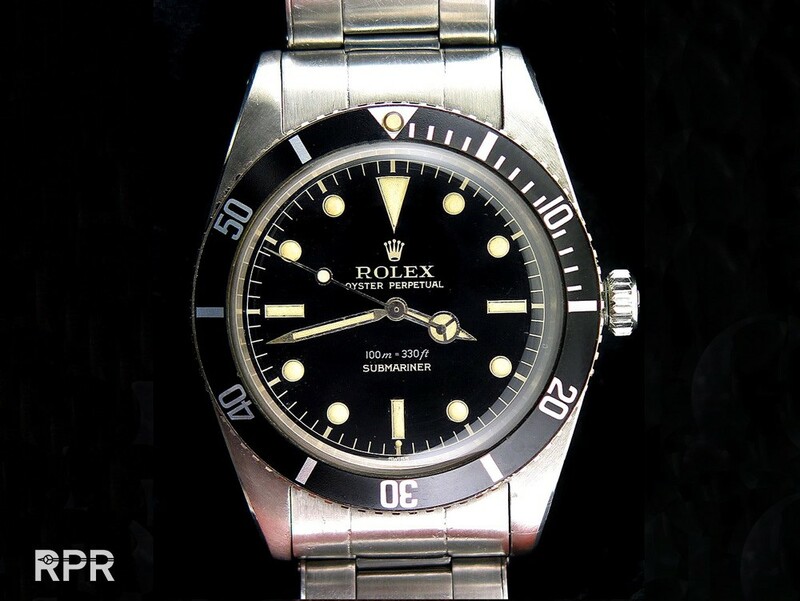 1957 – 1960, When Rolex lowered radiation and chanced dial printing from 1 to 2 colored print and enhanced the lacquer to a more glossy variant. 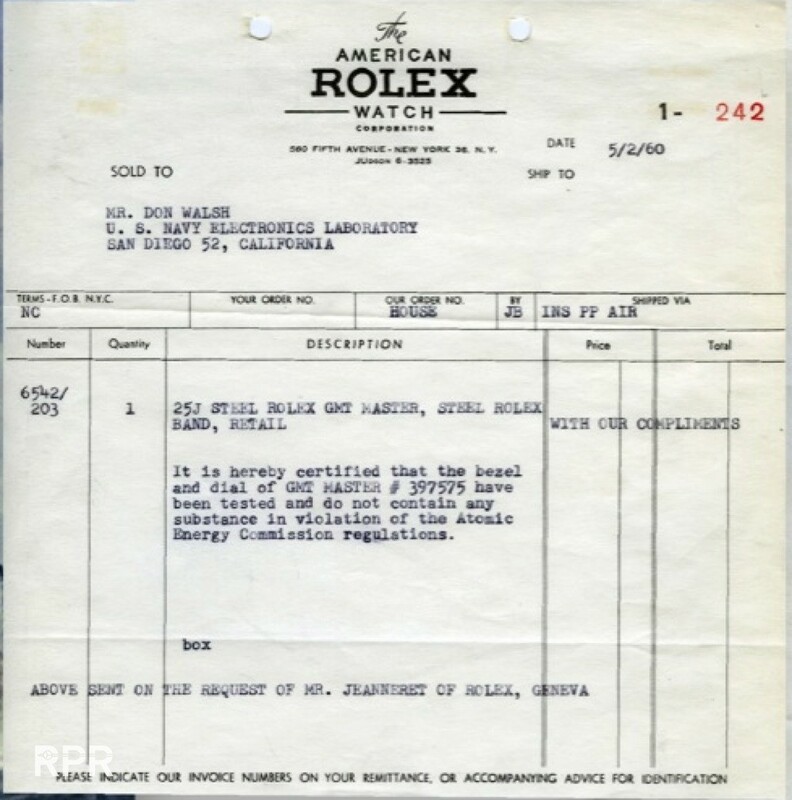 1960 – 1963, The pre ‘Transitional” period with “Exclamation” mark and due to the starting international regulation, again less radioactive luminous. 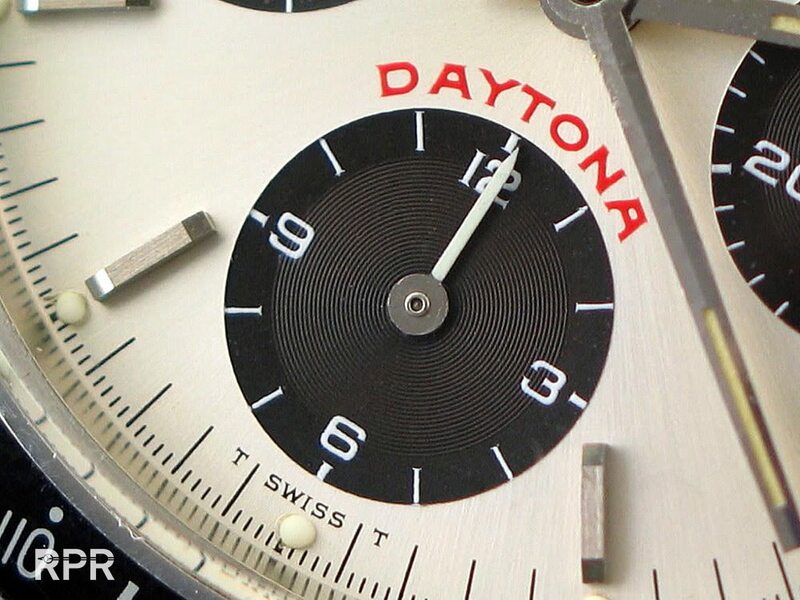 1963 – 1964, “Transitional” underline of which Rolex switched from Radium to Trtium, delivered dials are “swiss” signed but laminated with tritium. 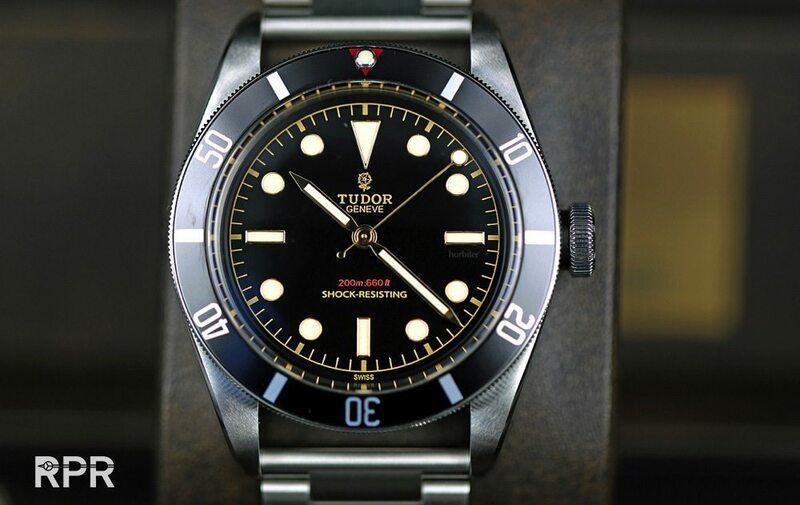 1964 – 1967, The new generation tritium luminous got added on glossy dials, signing chanced from “Swiss” to “Swiss – T<25” & “T-Swiss-T”. 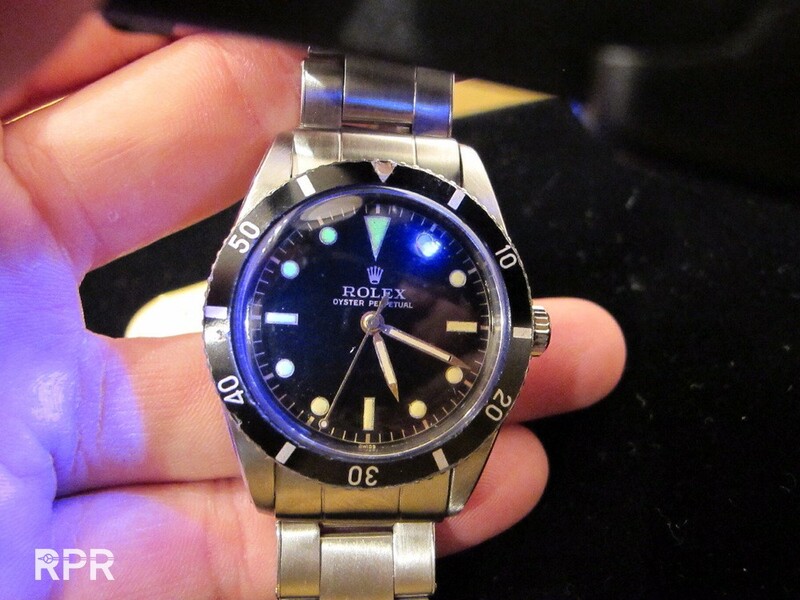 1967 – 1983, The matte dial with tritium luminous got introduced by Rolex. 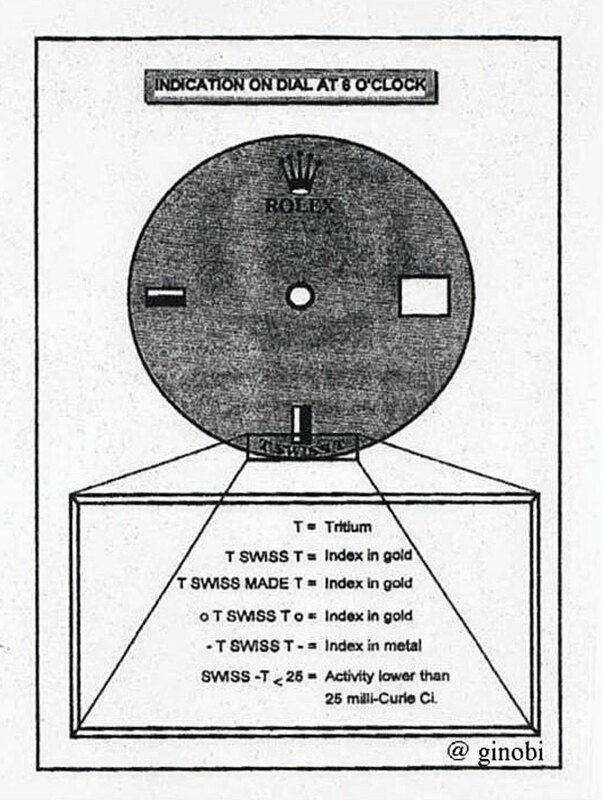 We see tritium signings variations like T Swiss T<25 or σ T-Swiss-T σ. 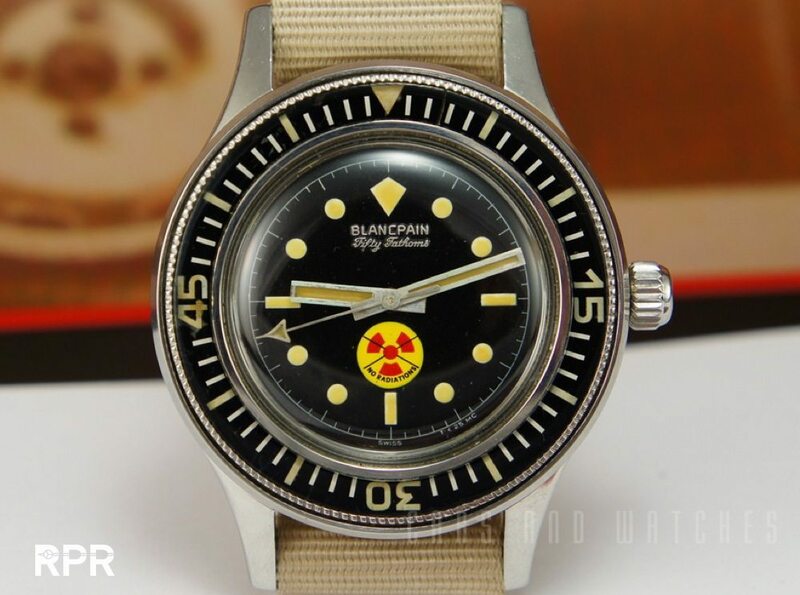 1983 – 1997, The last era of the tritium dials when the glossy dial surface came back, now the luminous was added in a added white gold surround. 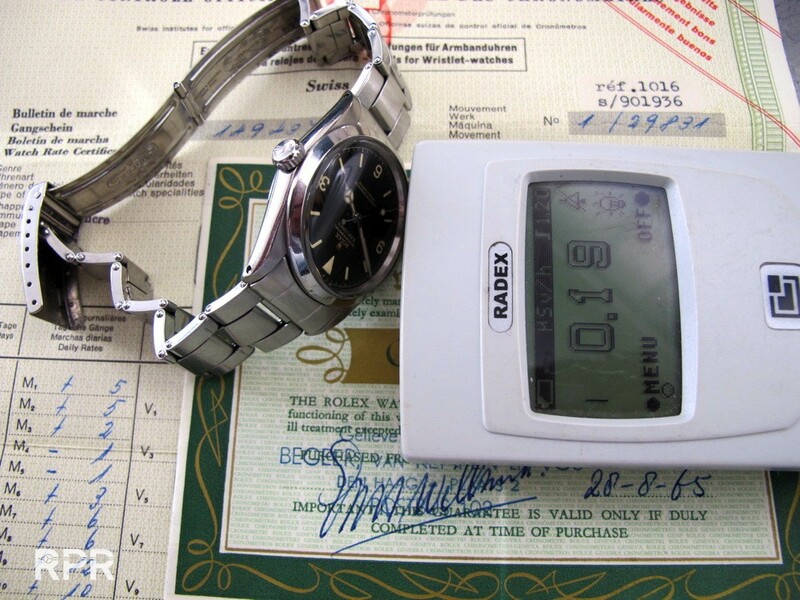 1998- 2000, LumiNova was invented in 1993 and patented in 1995; Nemoto & Co. Ltd. was contracted in 1998 to provide LumiNova to Switzerland. 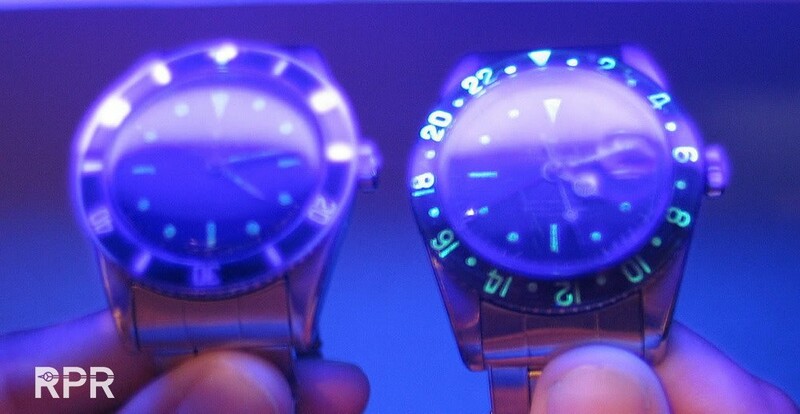 2000 – 2008, Super Luminova, a improved version of Luminova, a material that has the same properties as tritium but is not radioactive. 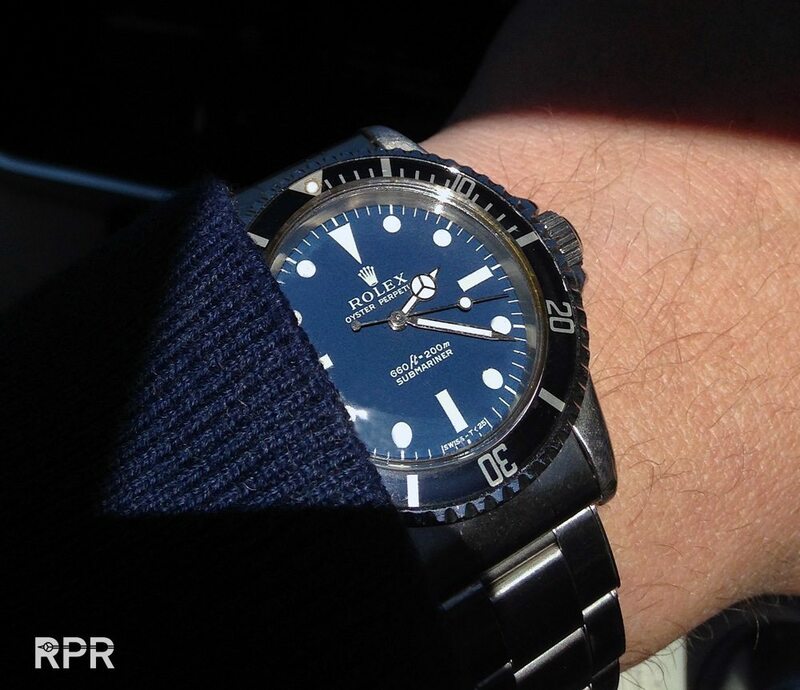 2008 – now, Chroma Light, the new blue-ish colored Super Luminova thats been in use since Rolex patented it. 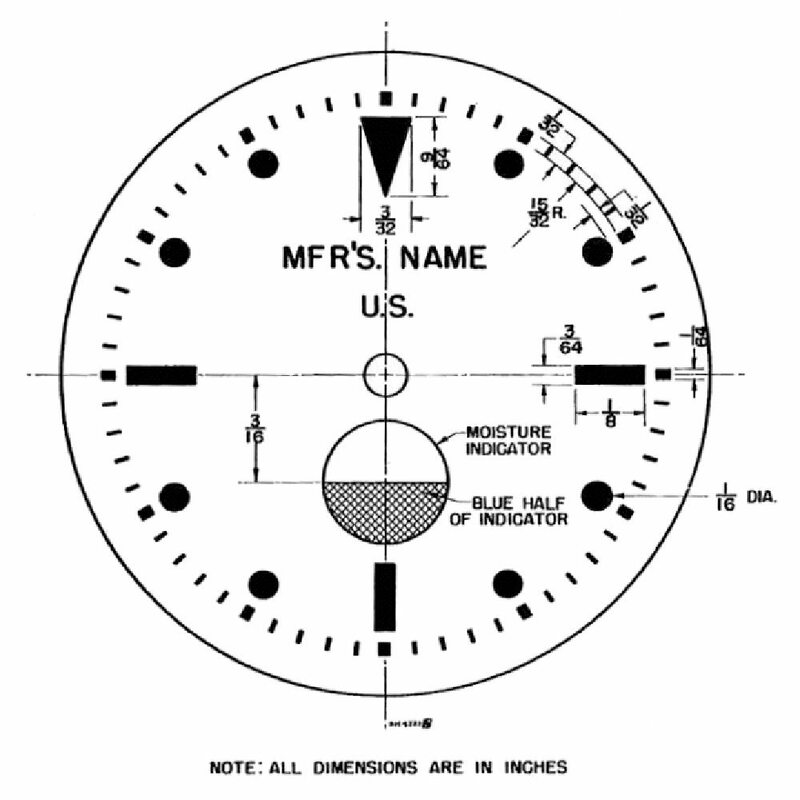 The early aged radium dials from the 20-ies and 30-ies where merely fitted on a emaille surface, using strong first generation Radium that by then not known that it could be dangerous. 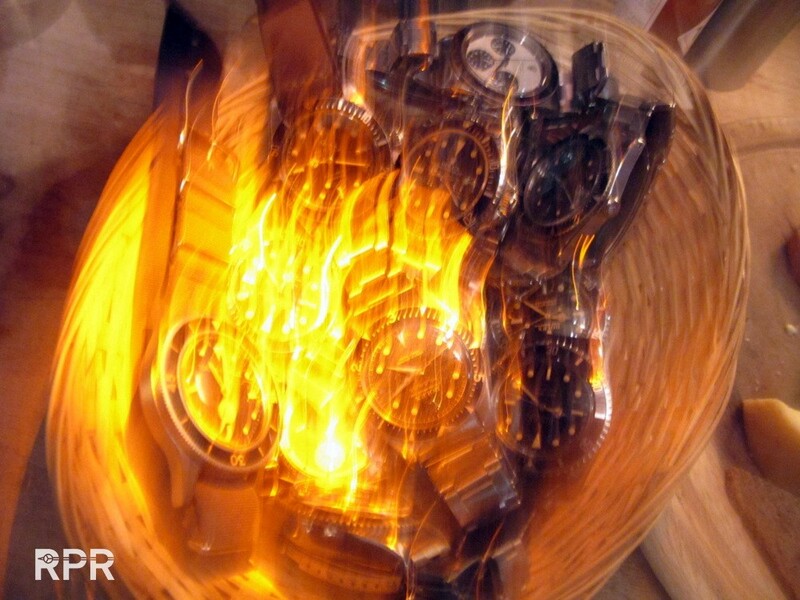 In contraire, radium drinks where sold to cure health issues but soon this chanced after the tragic story about the Radium Girls. 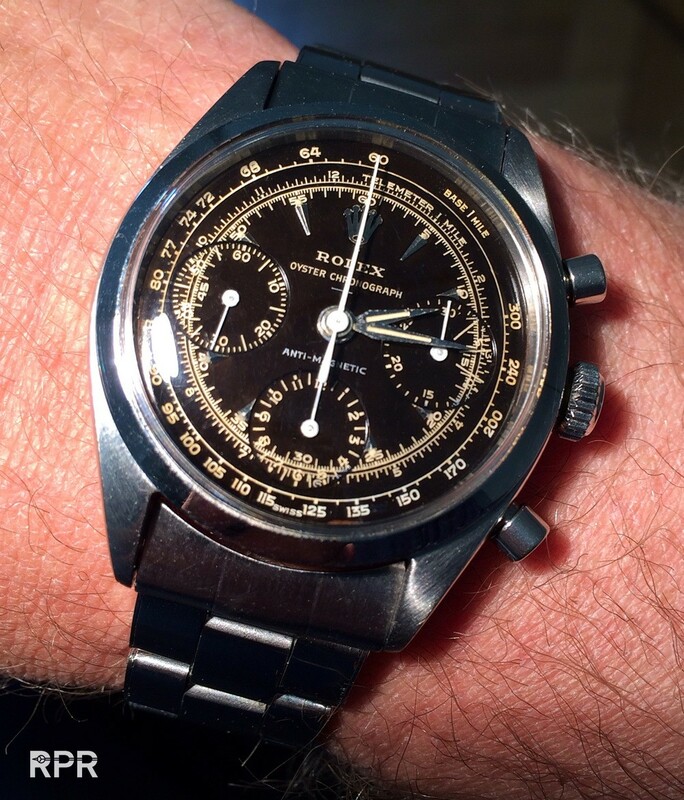 But for most Rolex collectors under us, the period that started at collecting Rolex is from 1953, the most interesting time phrases for aficionado’s. 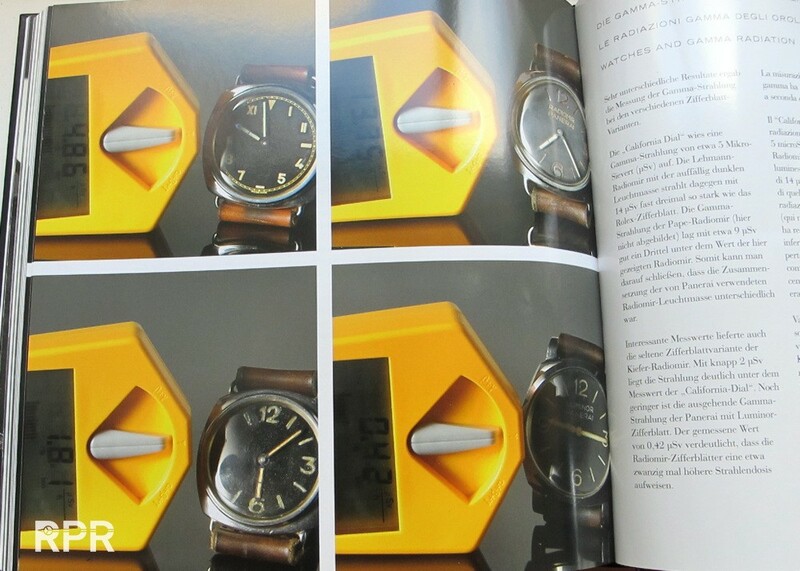 The Turn O Graph Ref. 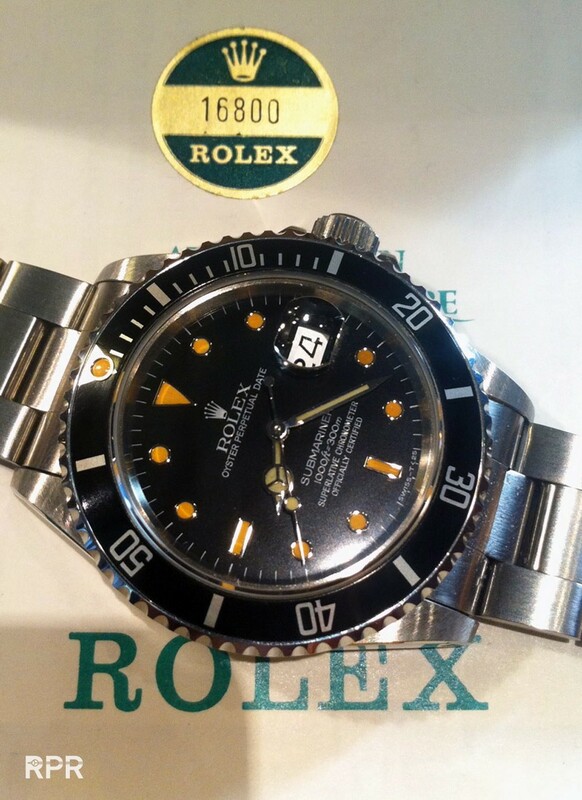 6202, Submariner Ref. 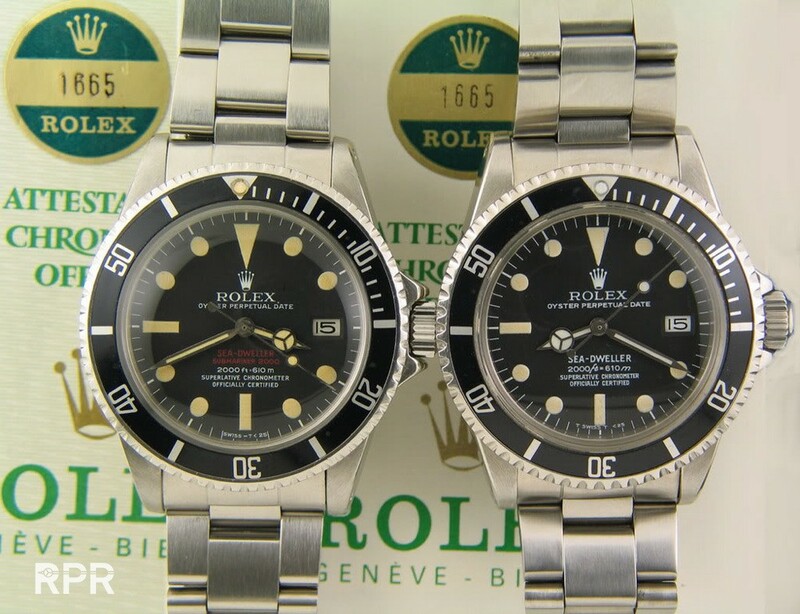 6204 & 6205 and later the Big Crown Ref. 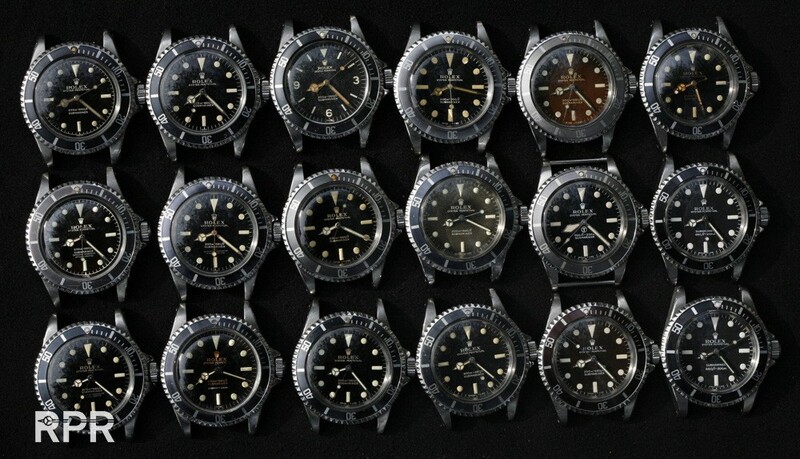 6200 are the beginning of the since then ever lasting legendary tool – sports watch concept.. What we see in above and in below pictures are first generation Rolex Sports models. 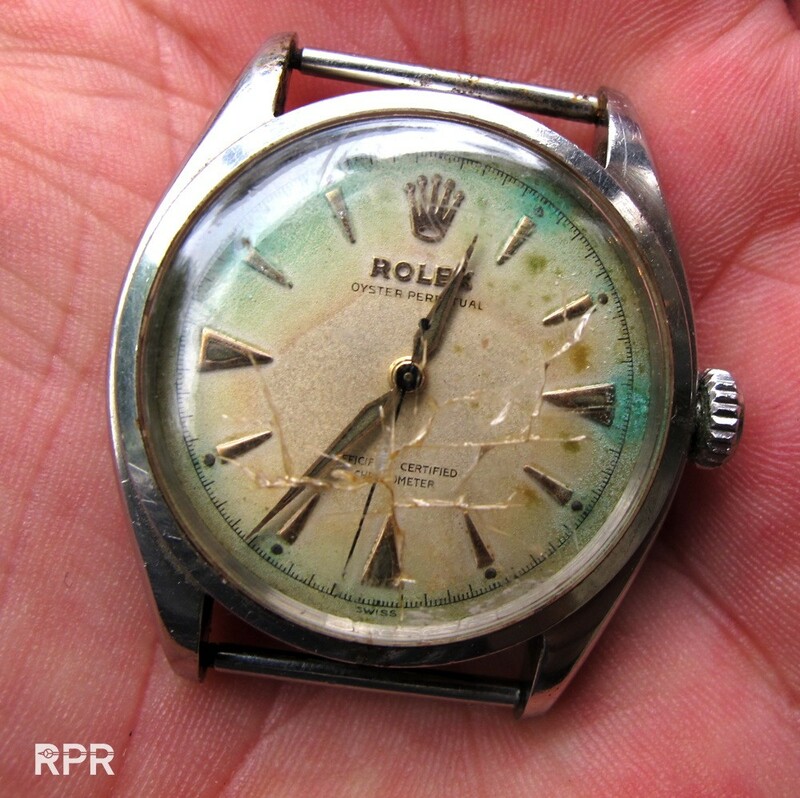 In many cases the radium luminous has turned greenish when moisture – condense came into the case as you can see above. 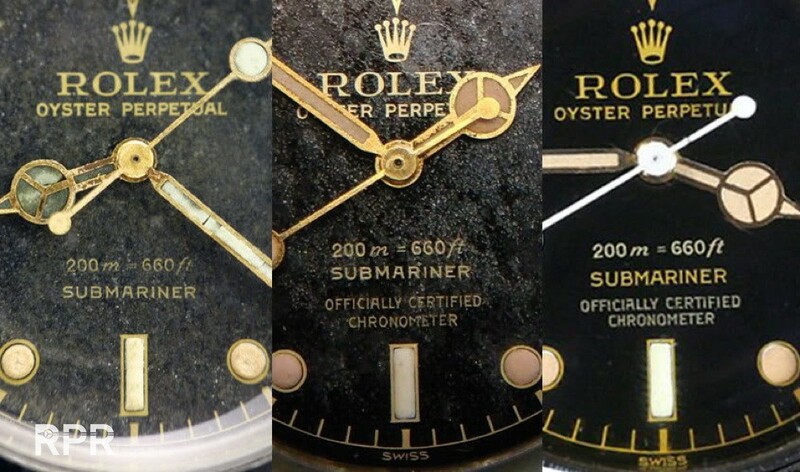 In below Submariner ref 6200 you can clearly see that the radium dust is covered over the dial, mostly around the radium plots. 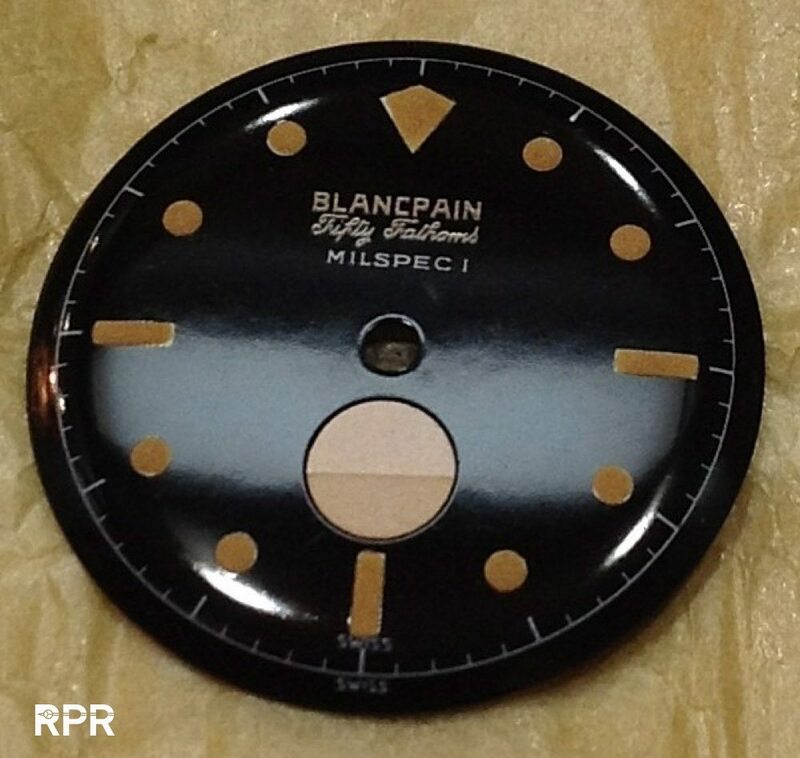 One of the characteristics of these early sport dials is the fact the they have a 1 color print and a lacquer finish thats not as shinny as we see in later examples. 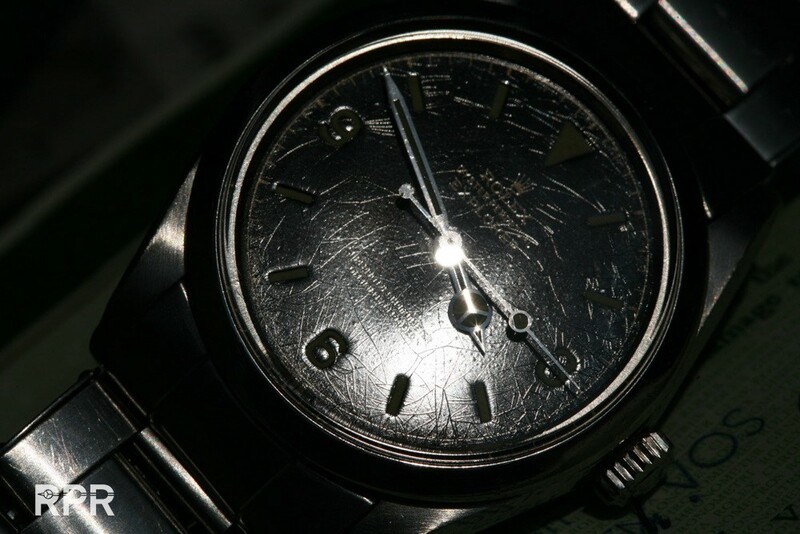 The radium dust, one never must inhale, leave small stains on the surface of the dial. 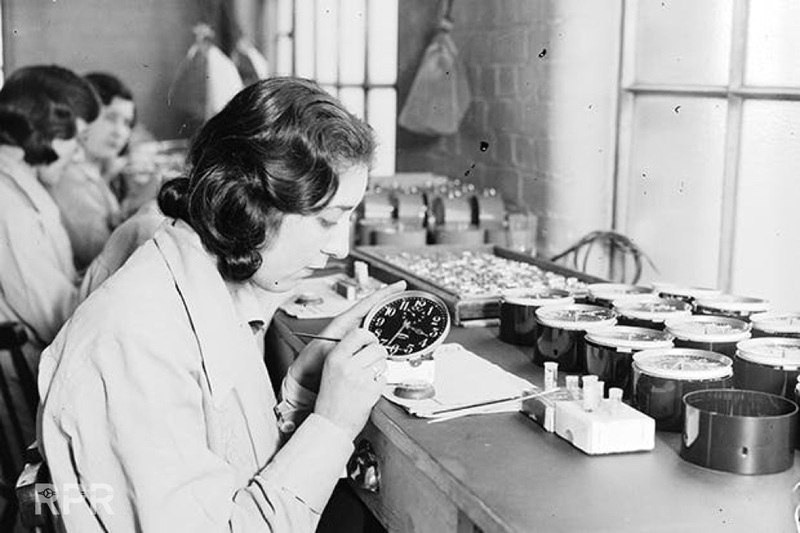 In below picture you can also clearly see the transparant paste in the hands that was added before the radium luminous came on top. 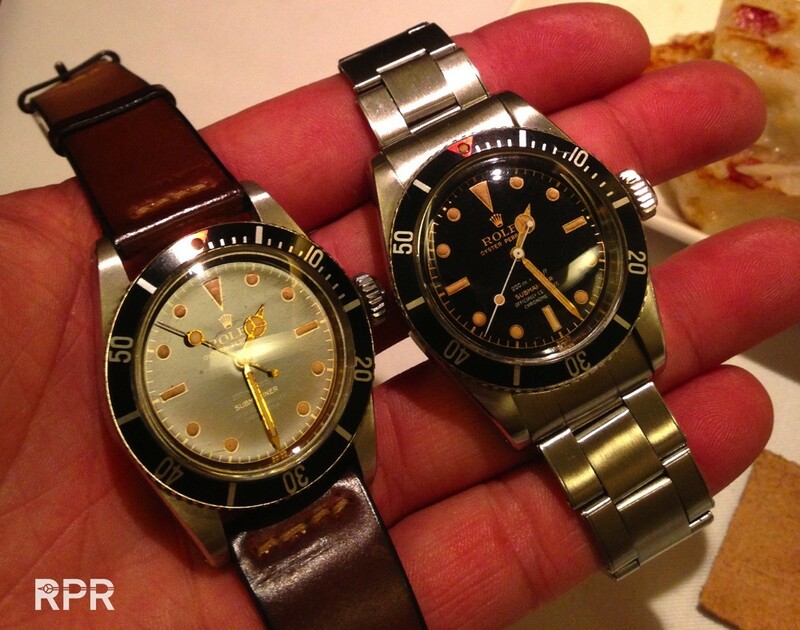 2 x Submariner Big Crown but both very different in detail. 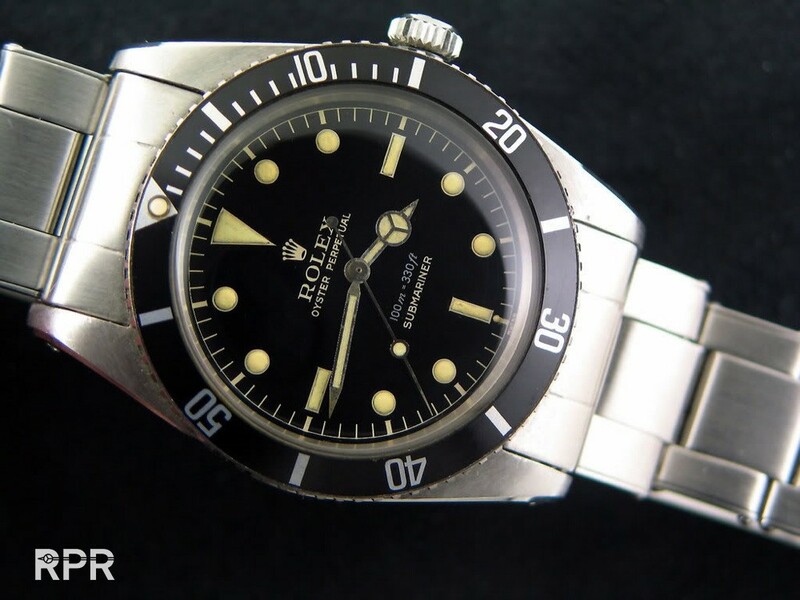 First is a 1954 Ref 6200 with later added “Submariner” at 6 O’clock, secondly we see a 1958 Ref 6538 with 4 line dial, besides the depth rate and Submariner, this version has a OCC ( Official Certified Chronometer ) movement. 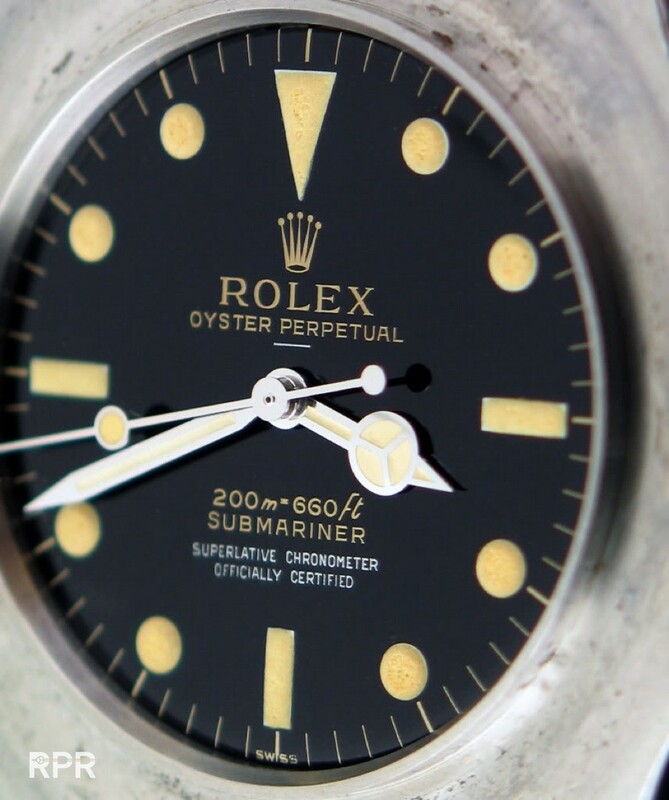 Up close a early Ref 6204 with black “Honeycomb” dial, split logo ( Submariner & Perpetual) pencil hands and slightly visible, the OCC sign at 6 o’clock. 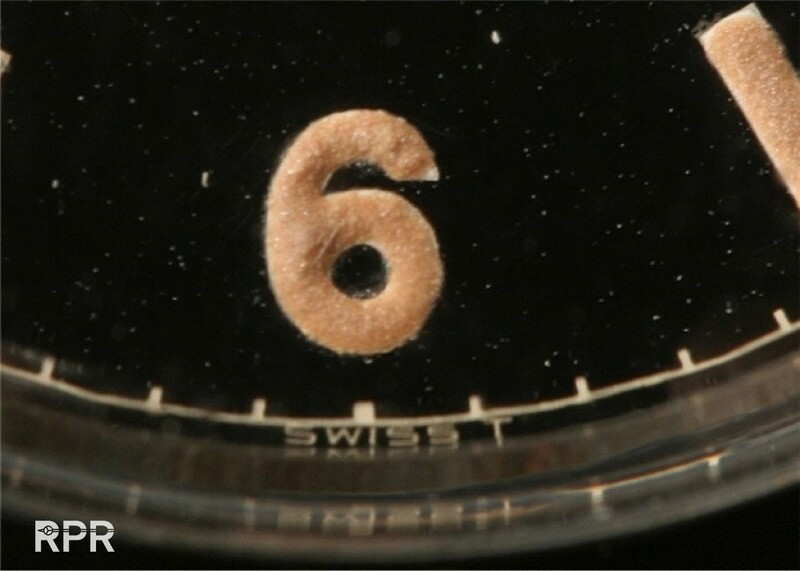 The radium dust has slightly eaten the dial surface. 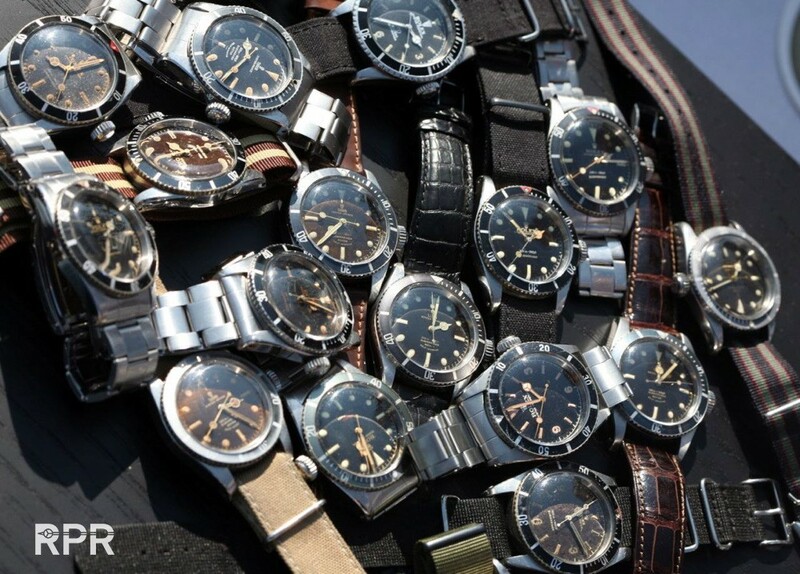 The missing luminous in the second hand has been spread around the dial. 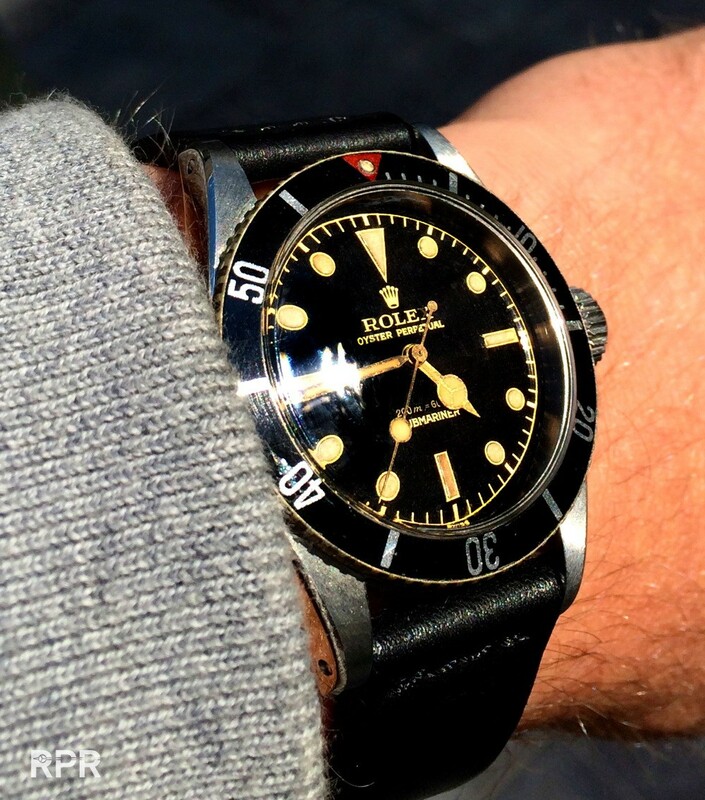 Moisture made the pencil hands inside turned dark as well as the plots on the dial greenish. 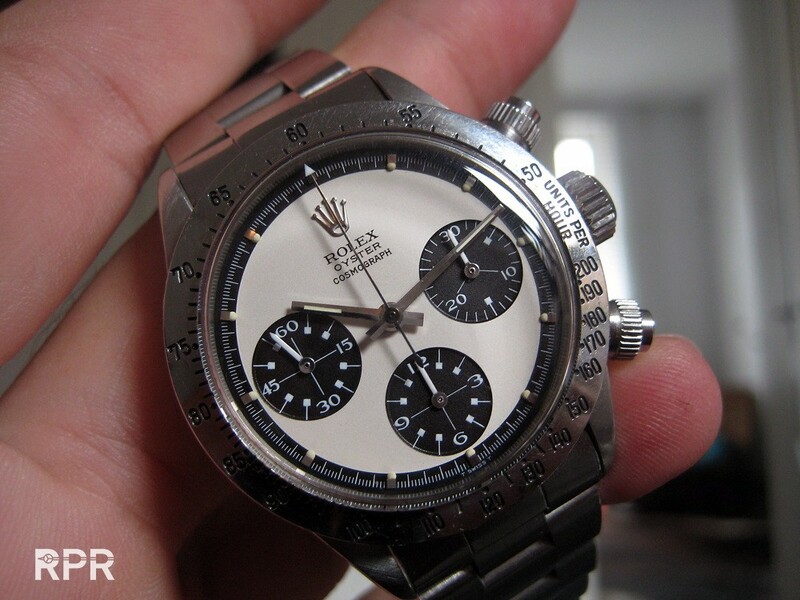 Next we see a first generation Big Crown Ref. 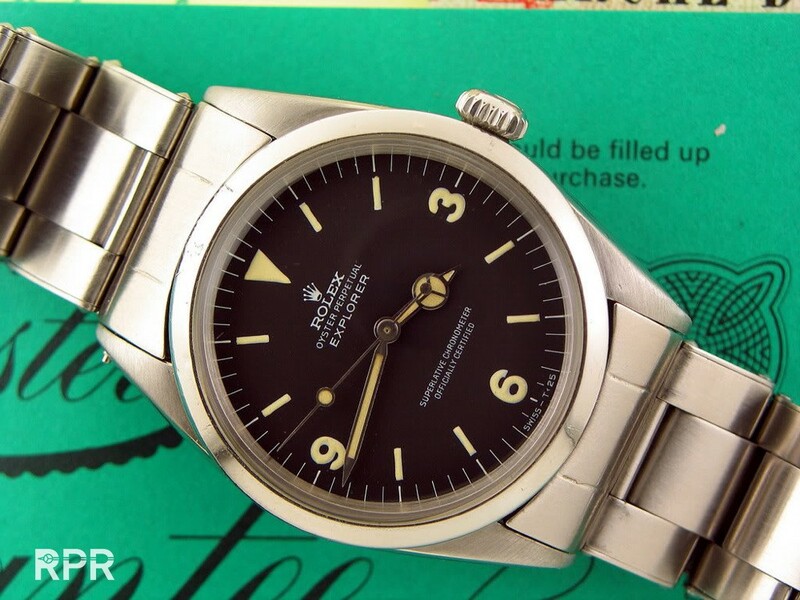 6538. 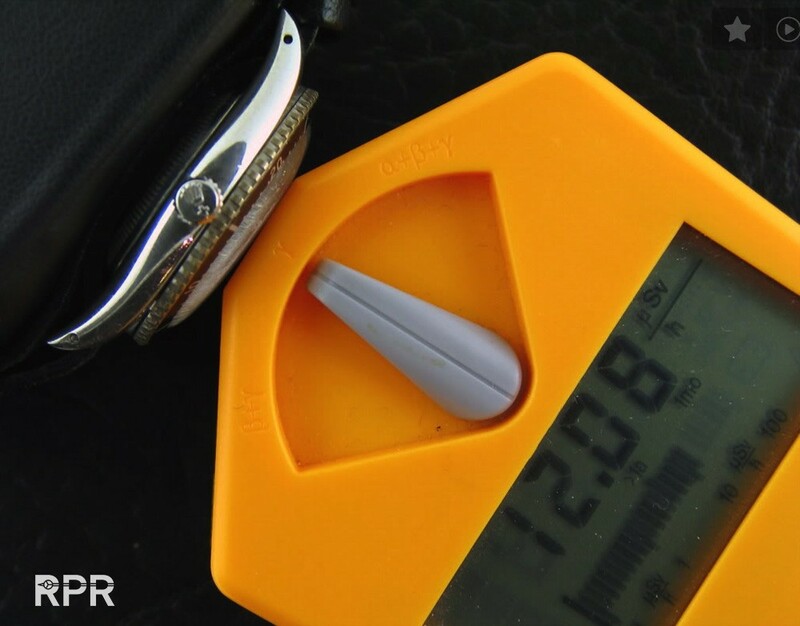 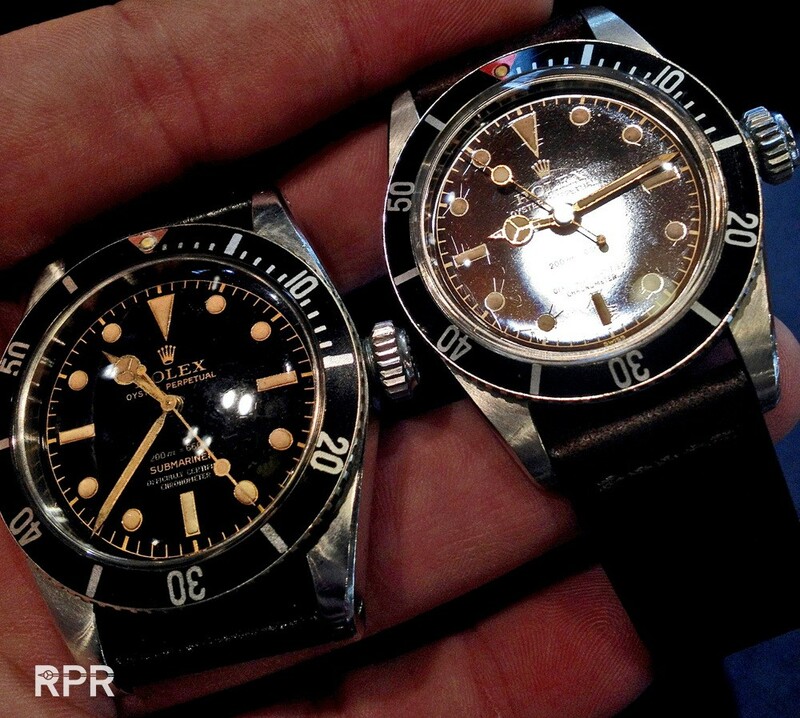 You notice that the depth rate ( 200M = 660Ft ) and the Submariner print are both in 1 color! 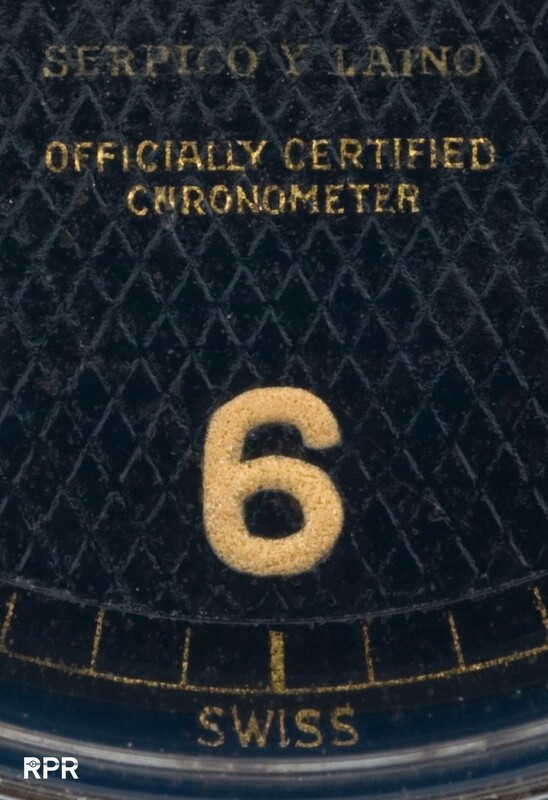 Another typical detail we see is the 6 o’clock marker being more bright then the rest of the radium plots. 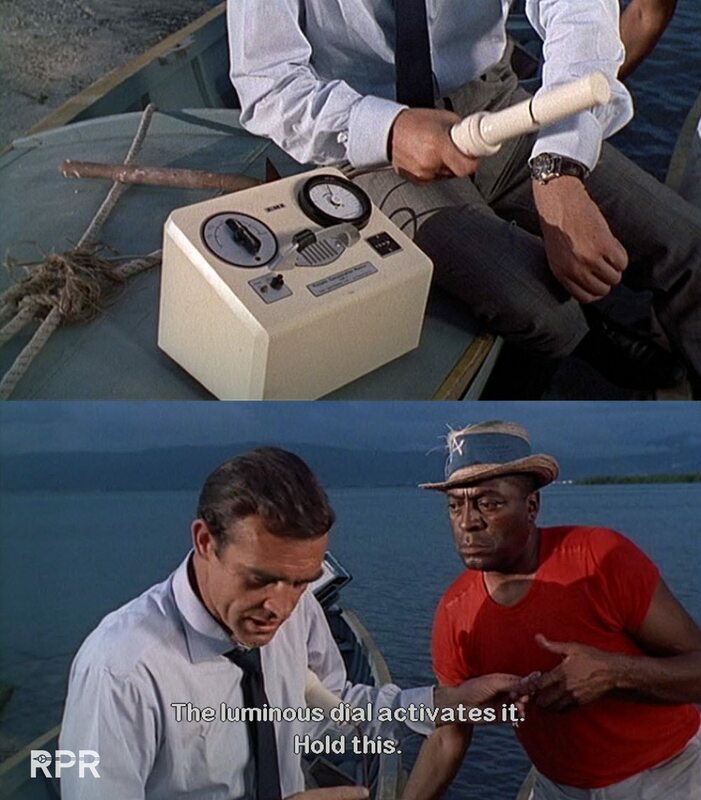 Most probably this marker is a special mix of radium for easier underwater readability. 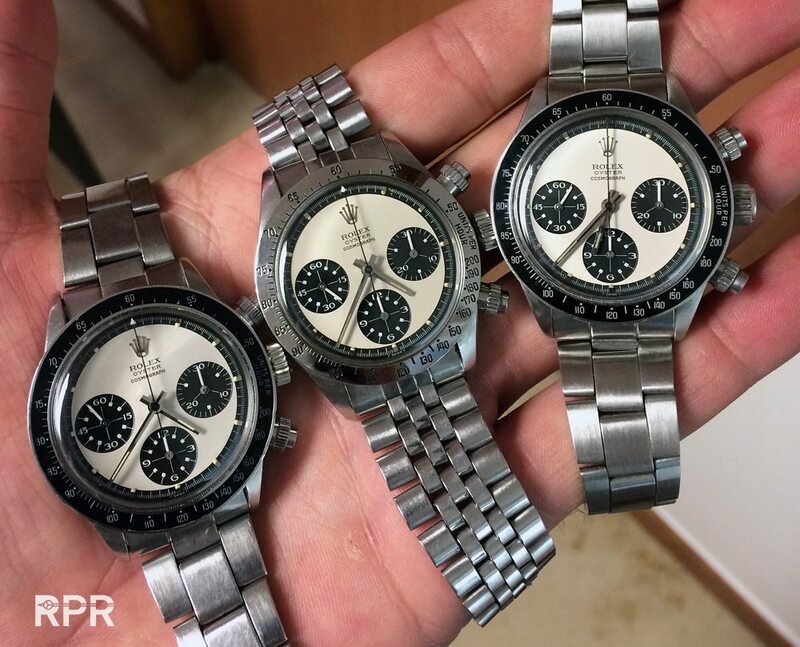 Detail comparison: Left and middle version are both early 6538’s with 1 color print, there where the right one is having a 2 color print ( for depth rate & OCC) Next to each other, second and first generation Rolex Big Crown’s. 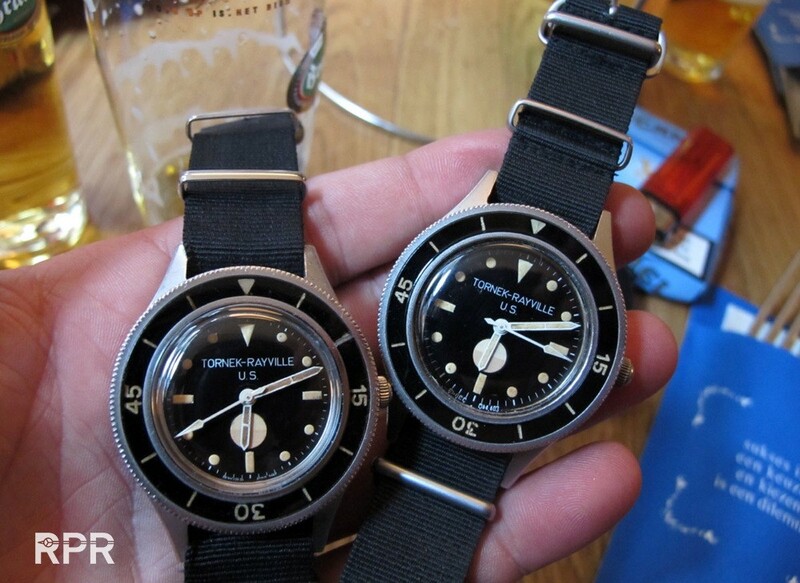 Clearly visible is the different finish that covers the dials, there where the later left one is all shinny and glossy is the right one of first generation. 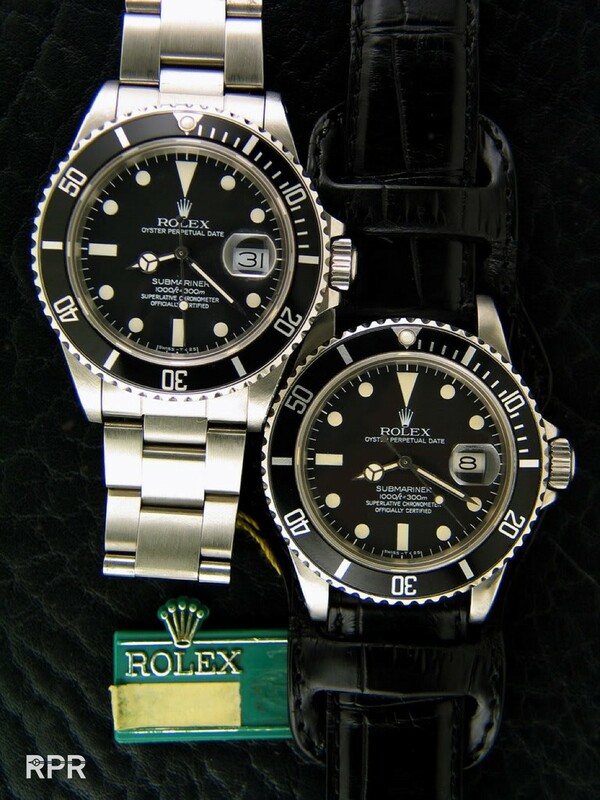 A lot of research I’ve done on these Submariner Big Crown’s and my standard procedure was to measure the dial with a geiger meter. 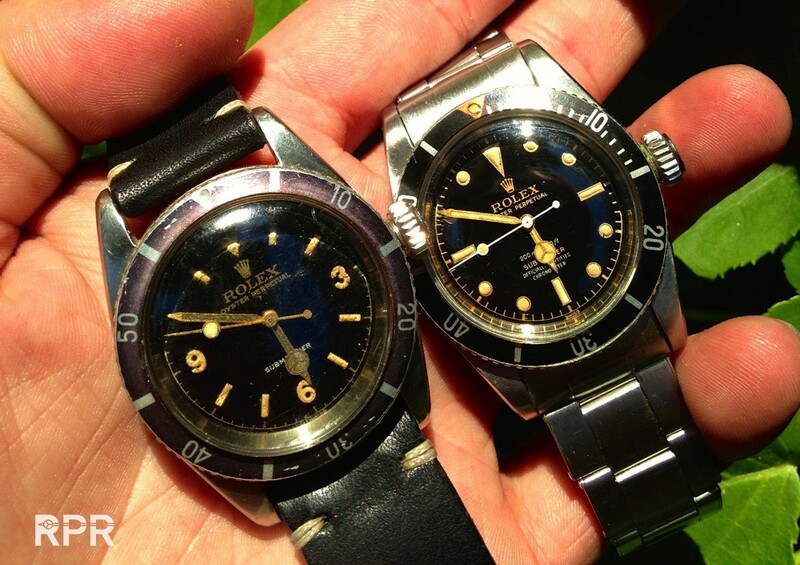 From the results I can inform you that the radiation between first & second generation 6538’s is significant, depending on the condition of the luminous of as well the dial and hands, the later glossy versions where at least 5 times less radio active, hence the better condition you find them now. 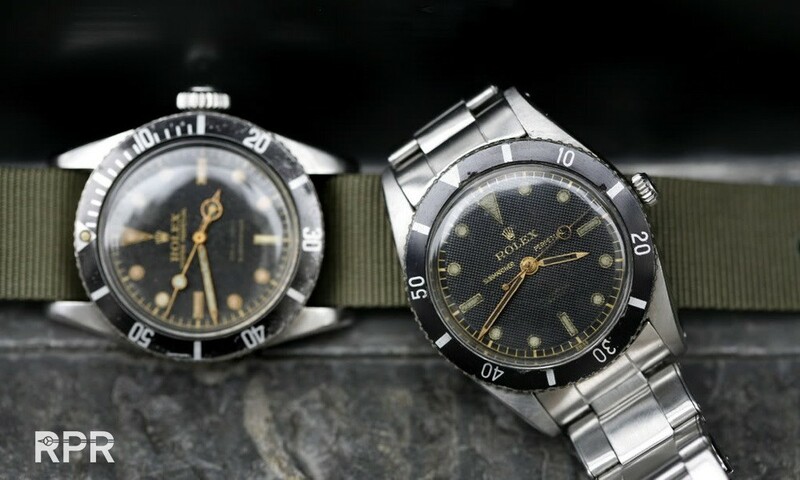 Close up of a fully in tact radium 6 o’clock Explorer ref 6350 marker from 1953… Comparison: You will notice that the graphic chanced over the years with the later version we see on the right. 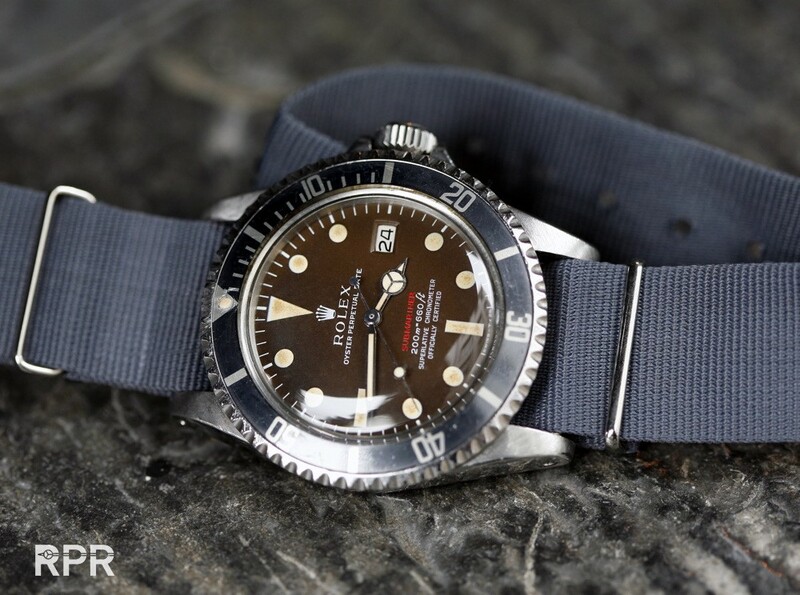 The Submariner text has become more modern. 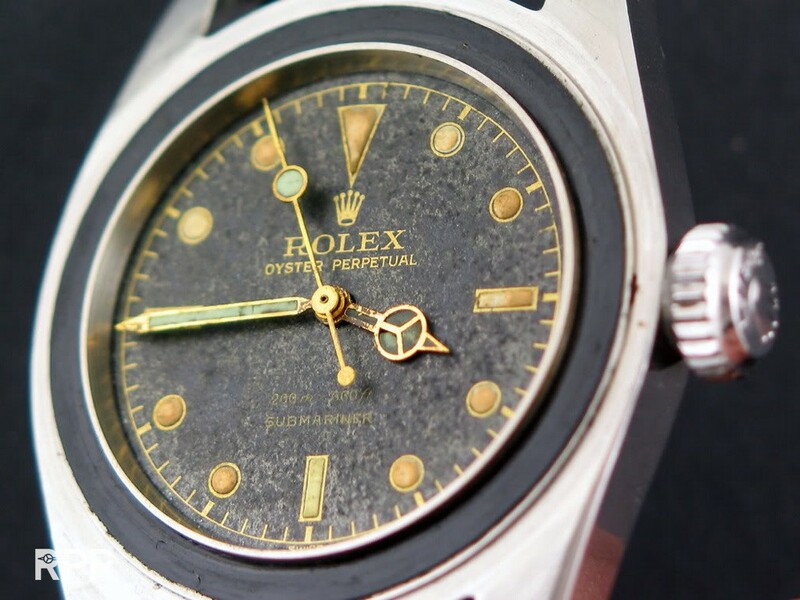 A typical detail you hardly see at any pictures on the internet is the unique patina of the glossy dial surface. 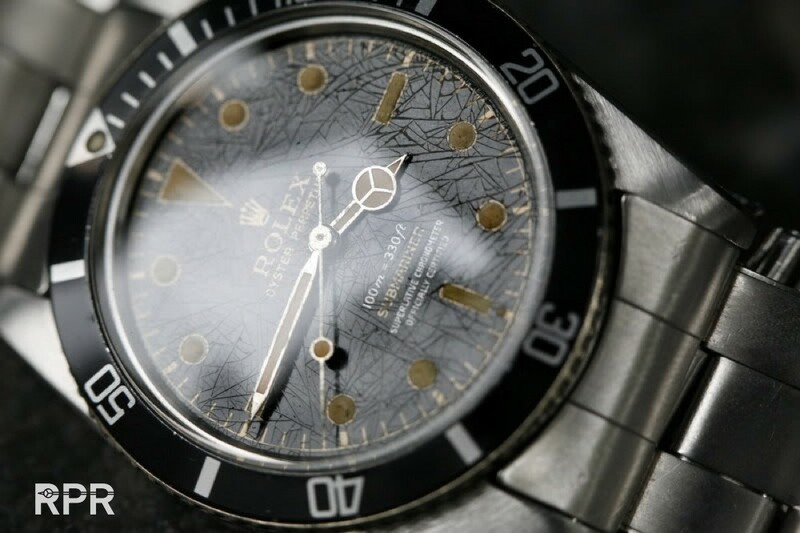 The to each glossy Rolex dial unique tiny cracks are only visible when you play with the light. 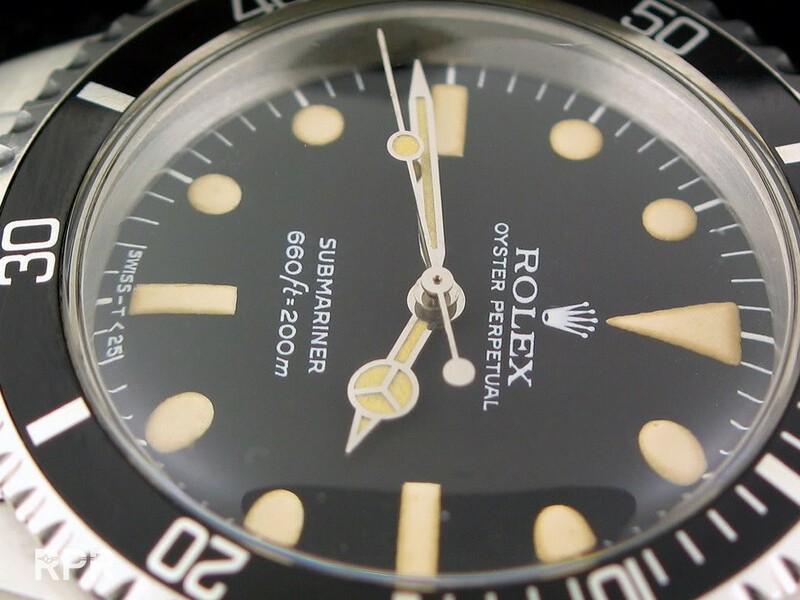 Furthermore we see that the top part of the Rolex print is punched in the dial and as well the ‘submariner print. 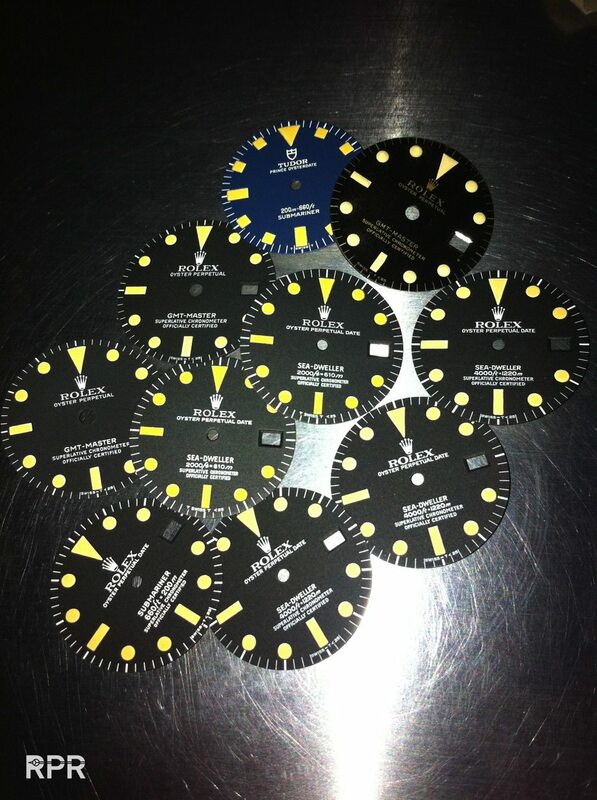 The depth rating and OCC are added later, on top of the finished lacquer, making it possible for Rolex to print 1 dial and later modify it for their needs. 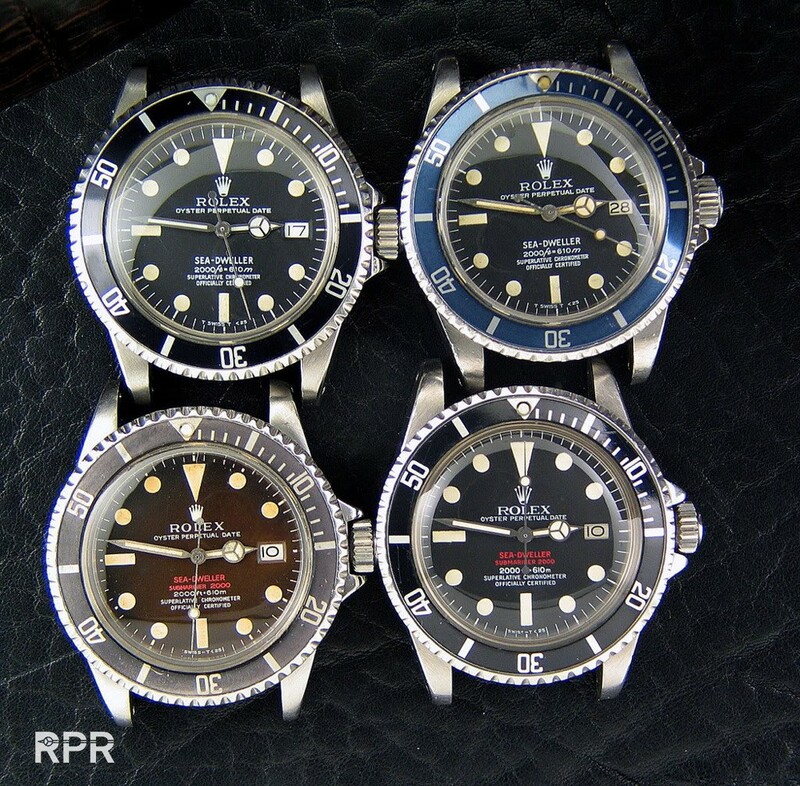 Not many Rolex collectors are aware about the fact that the Big Crown & Small Crown versions are having the same graphics. 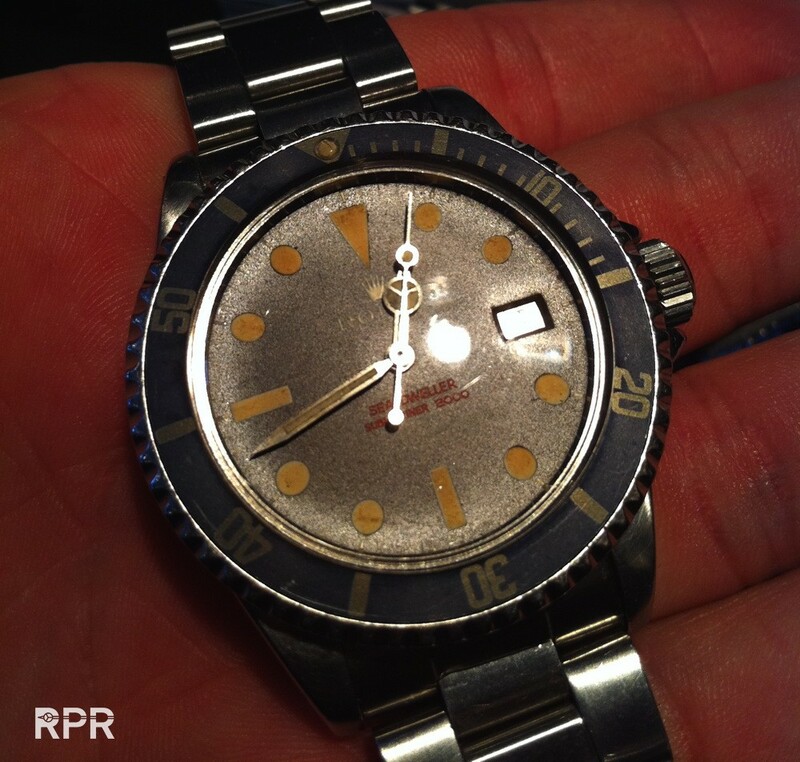 Below you see that at this pre stamped the depth rating for small crown was used and added over the already finished lac. 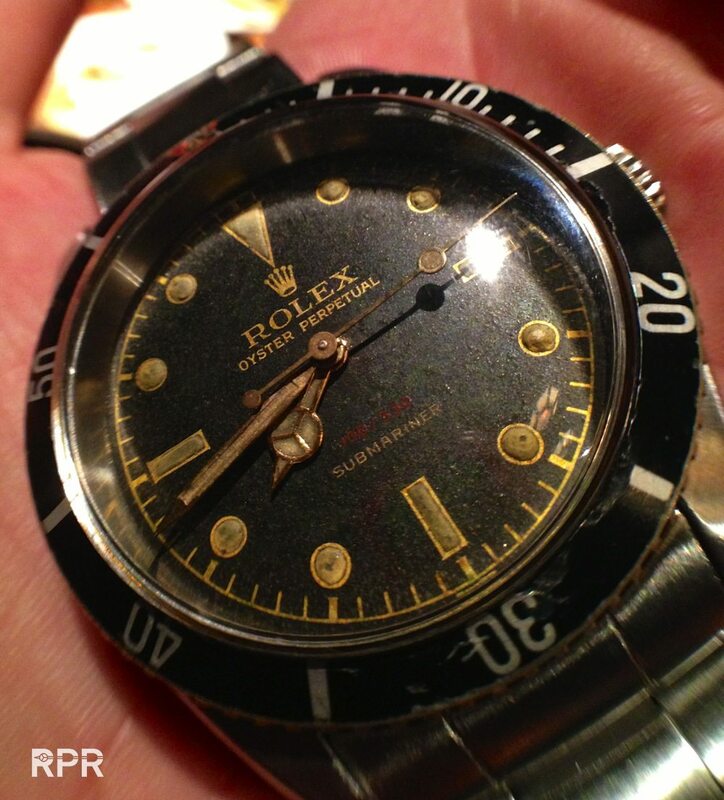 First Rolex service dial? 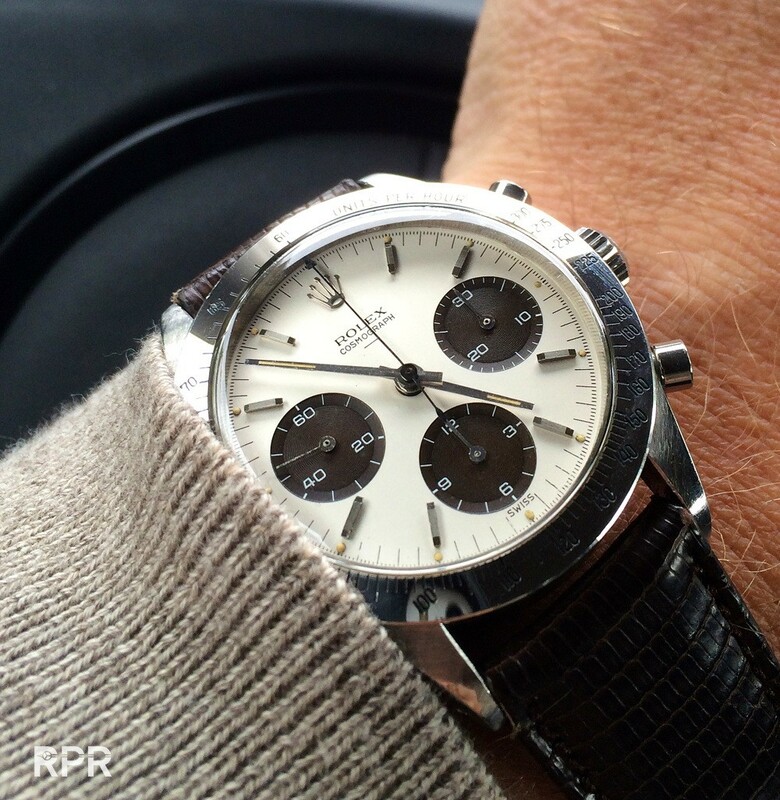 (follow the link to more vintage Rolex study). 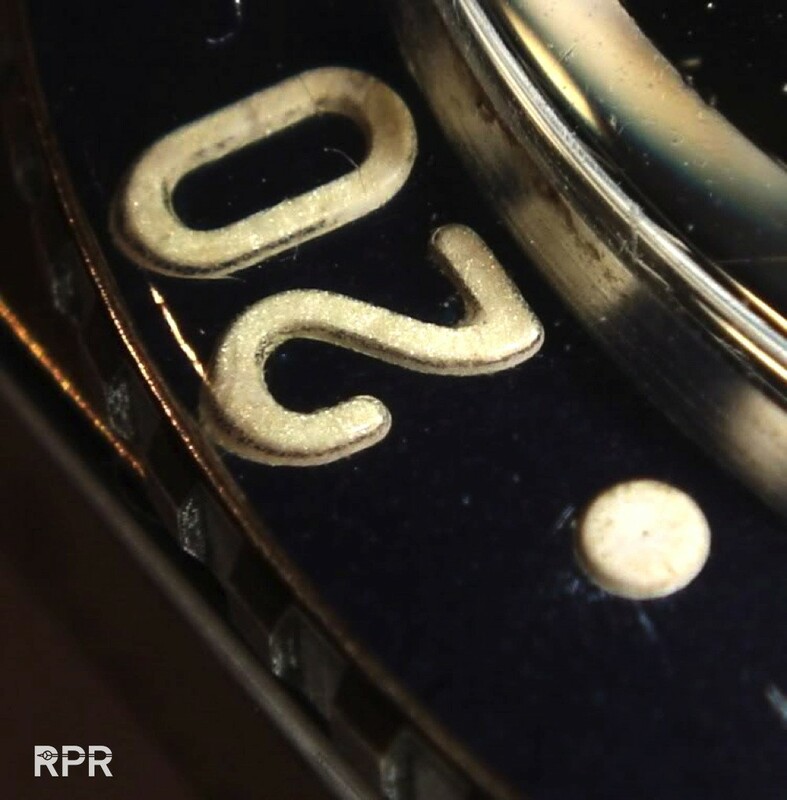 Another interesting detail is the white surface underneath the radium plots that was added to the dial so the luminous could stick on easily. 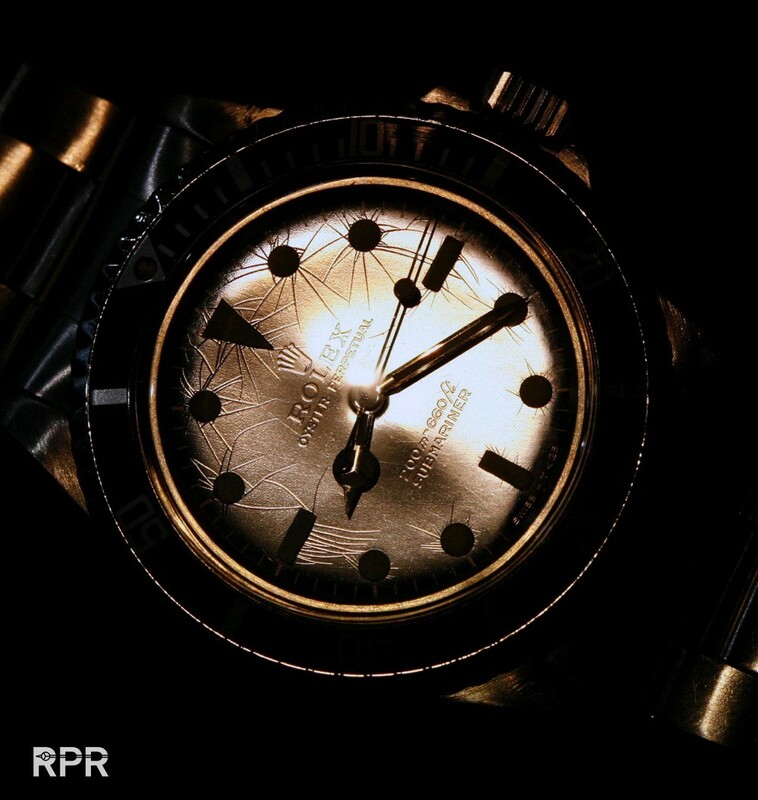 Rolex luminous is always between the gold surroundings and hardly ever will go over it, something you see with later resumed dials a lot, the luminous material is often bigger then the white plot. 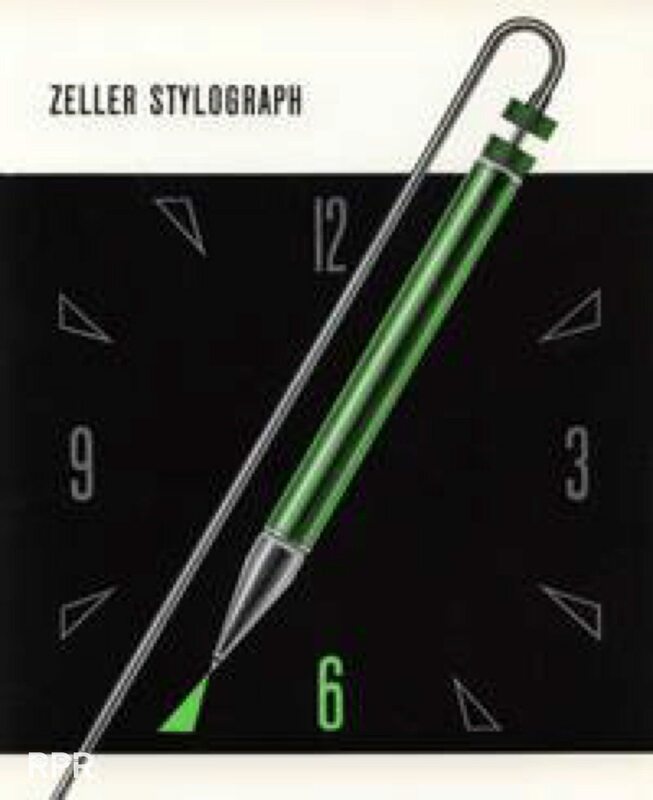 Find below the Zeller Stylograph from the luminous company RC Tritec used for applying the luminous on the dial and hands. 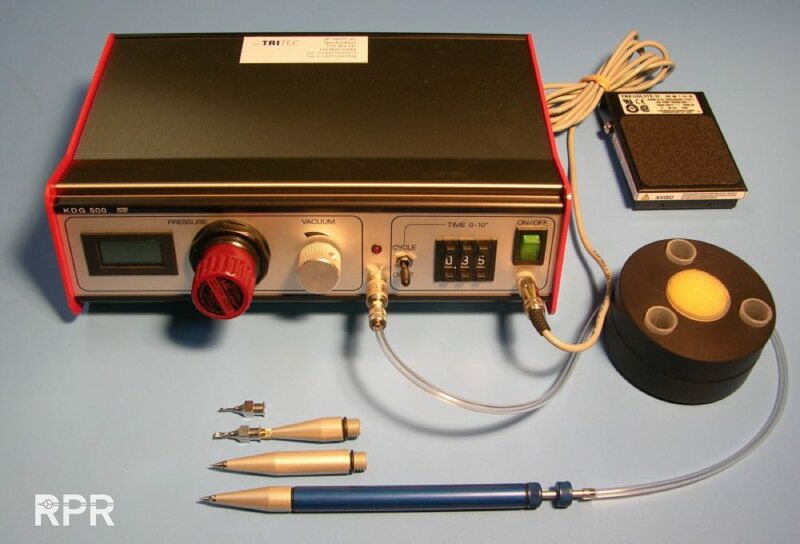 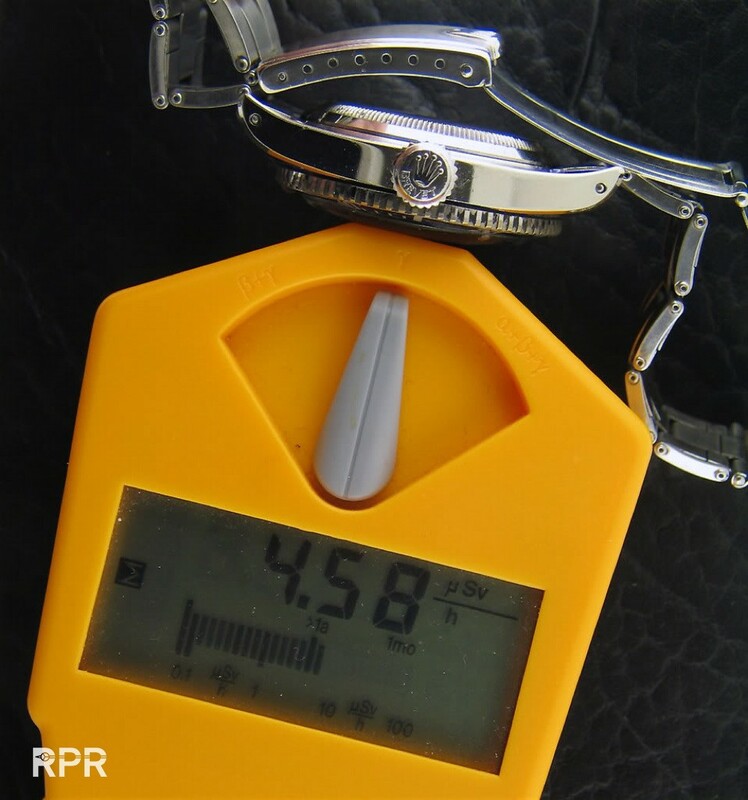 Also revolutionary was the moisture meter or humidity indicator. 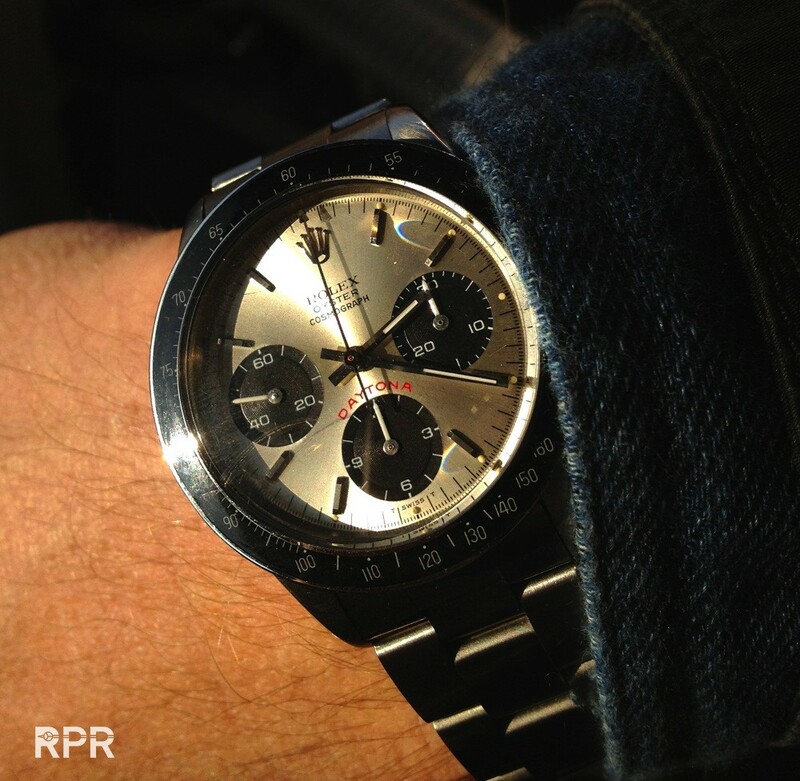 Originally, the indicators had a lower blue part that would change to pink once moisture seeped into the watch. 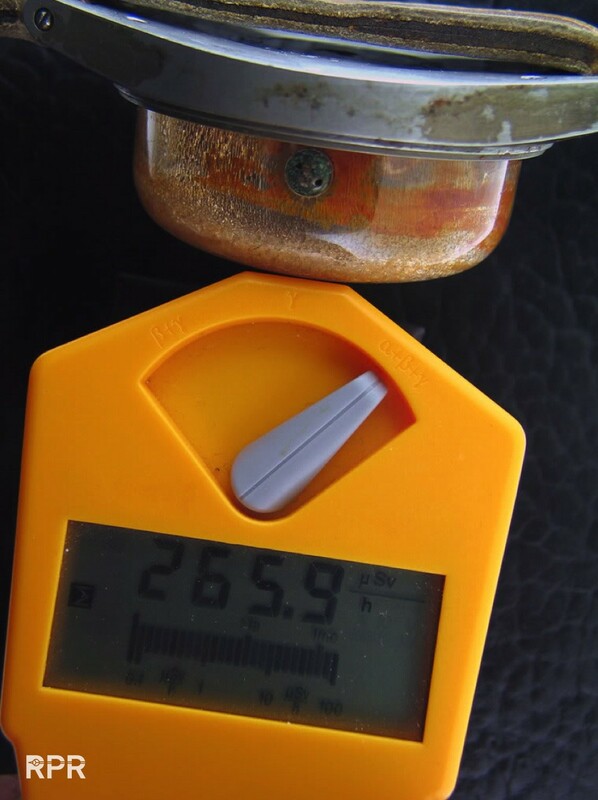 Both parts have become almost equally pink, moisture has touched the indicator. 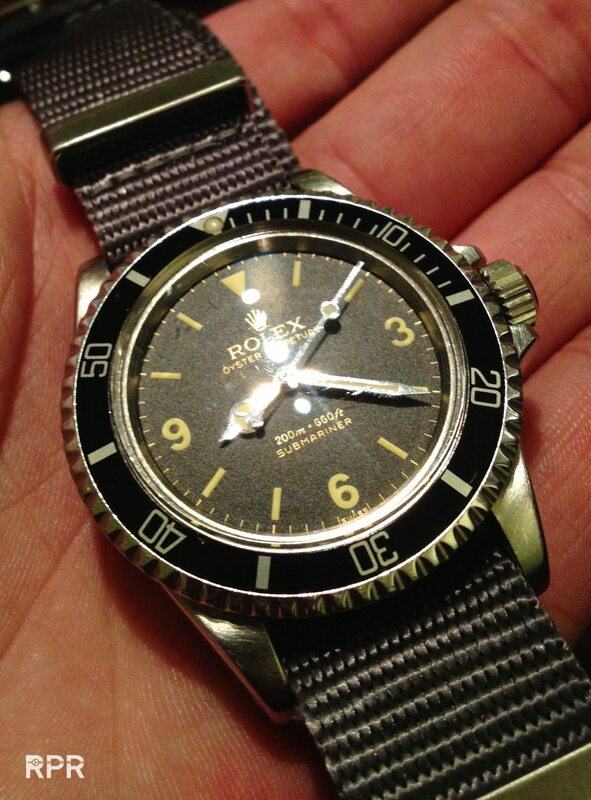 When you look closely, you will notice a rare feature vintage Rolex have as well in transitional period of radium to tritium; a double swiss printing at 6 o’clock…. 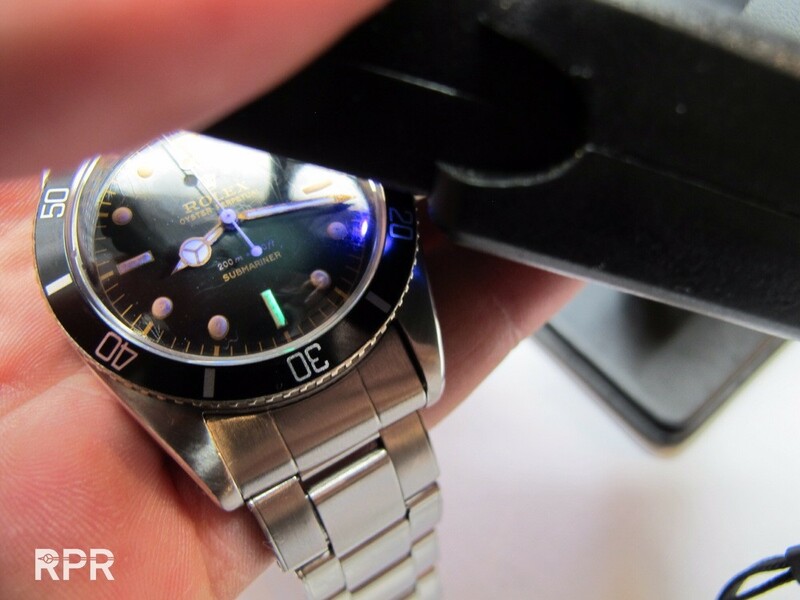 So if moisture enters the case, it will damage the surface and leave little black stains on the lume dots, as you can see below. 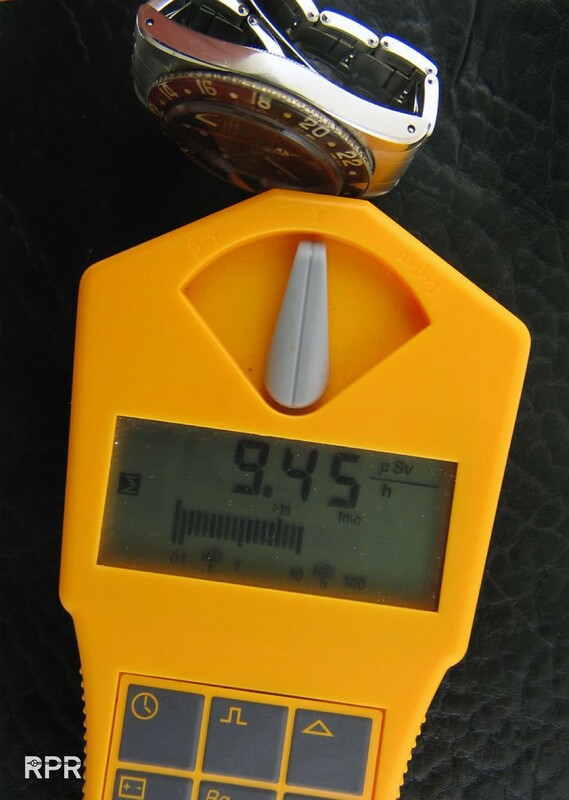 Again, the luminous on the dial and hands, are the condition meter showing you what happened over the years with the watch. 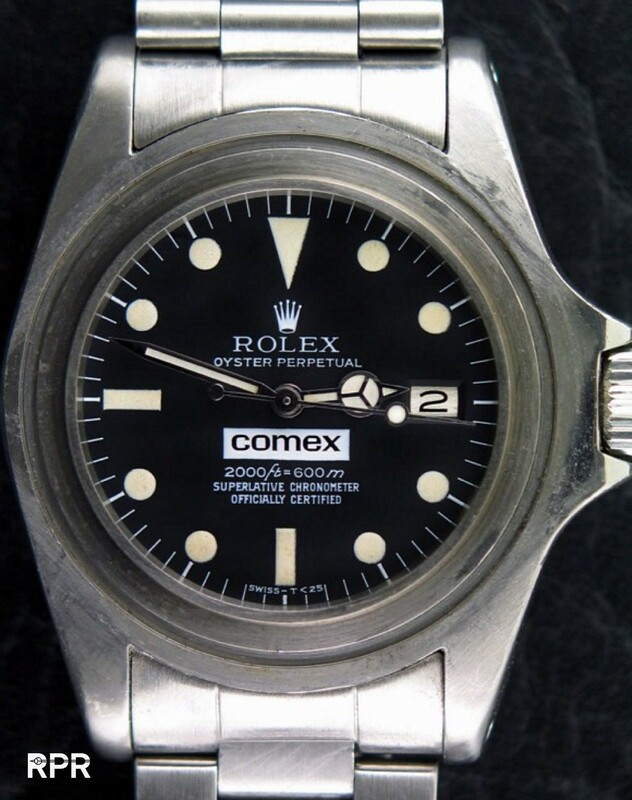 Moisture and condens will be sucked up by the luminous and make it chance color to dark and ugly, then it will destroy the top layer of the dial. 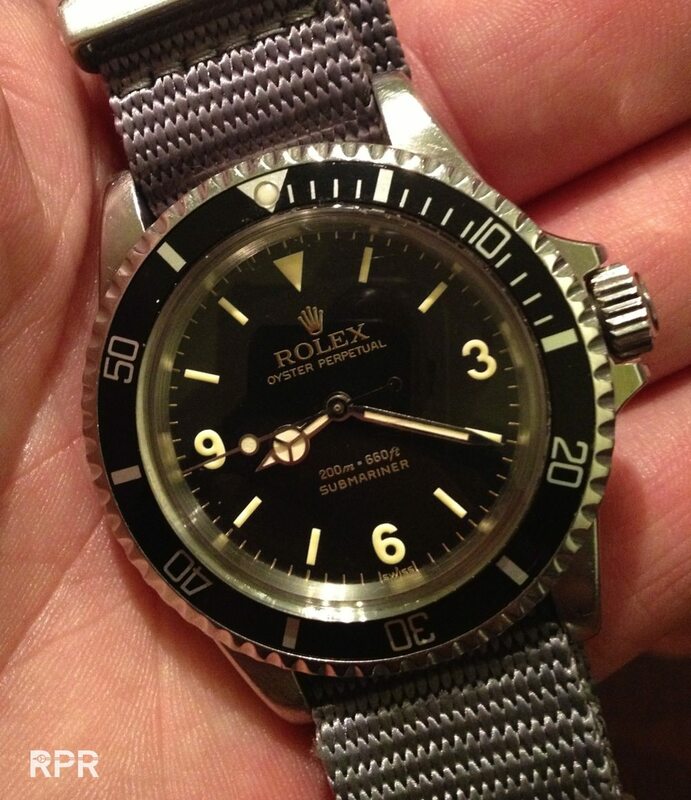 From the front hardly visible but once you turn the dial slightly you notice the infrastructure of cracks. 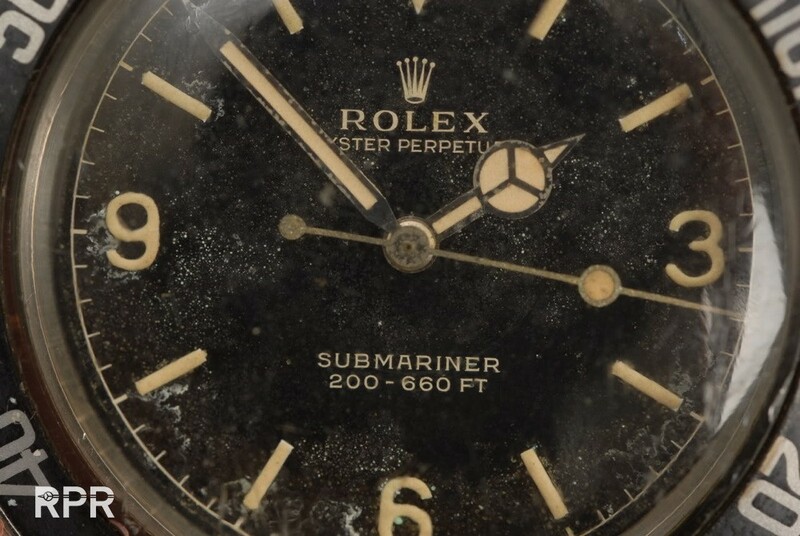 My believe is that the dials have been stored for a long time at a dry place and that this has cracked the surface… Yet another example of cracked surface. 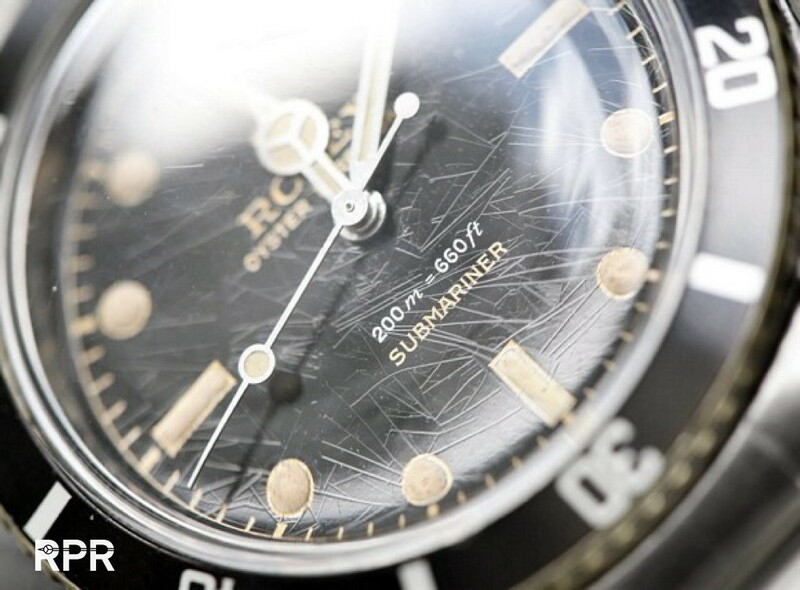 This particular SCOC small crown 5508 is almost all over damaged and the grooves have become very deep… And another cracked one. 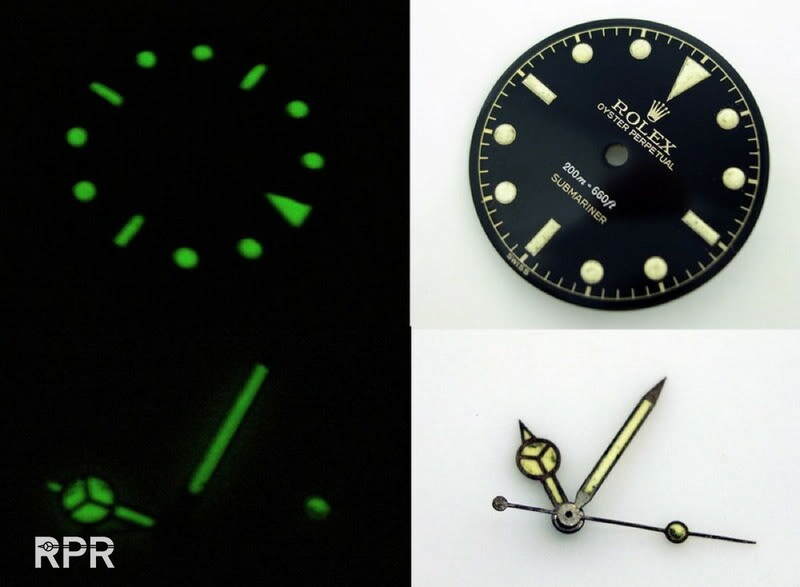 In both 3 examples we see that the hands have also been chanced during a service by Rolex to later smaller ones, meaning that all 3 of them had a water problem back in the days and the original radium hands where chanced to later tritium ones, hence the different in color of the luminous. 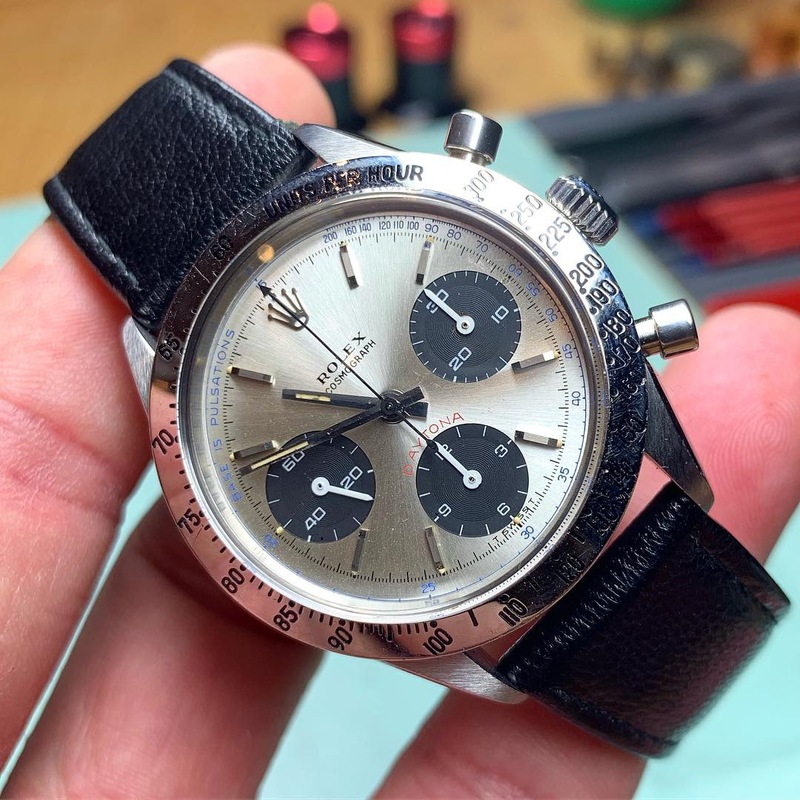 While analyzing the below 2 photo’s now you notice that the hands do NOT match the rest of the color of the luminous, thus something has happened afterwards before sit went to auction. 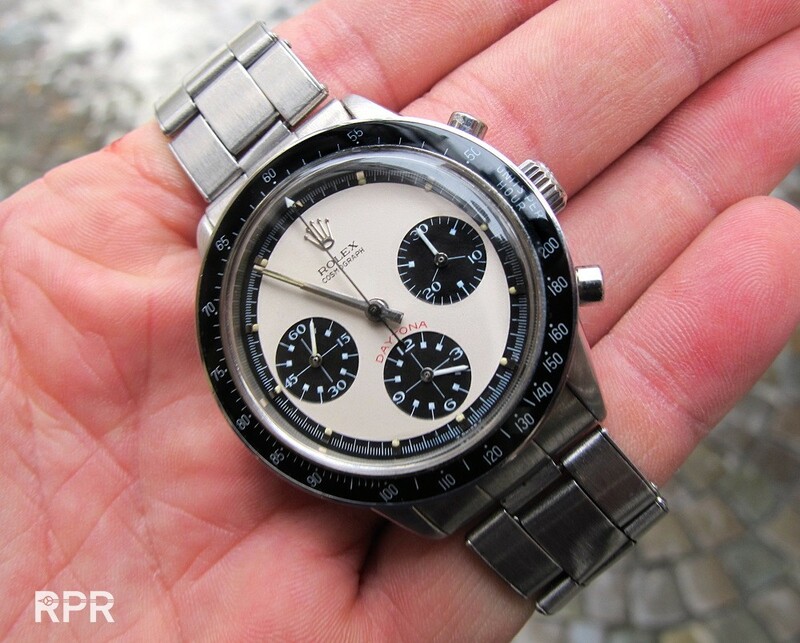 Are these the original hands and has the dial been swapped perhaps? 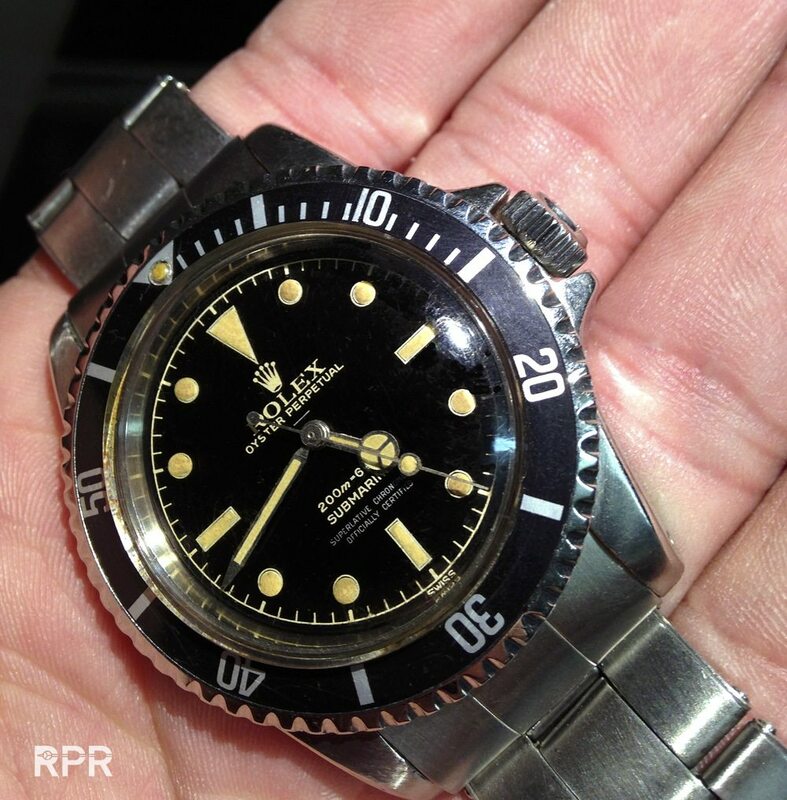 Below you can see pictures of the radium investigation I made on many different sport Rolex and other watches during the recent years. 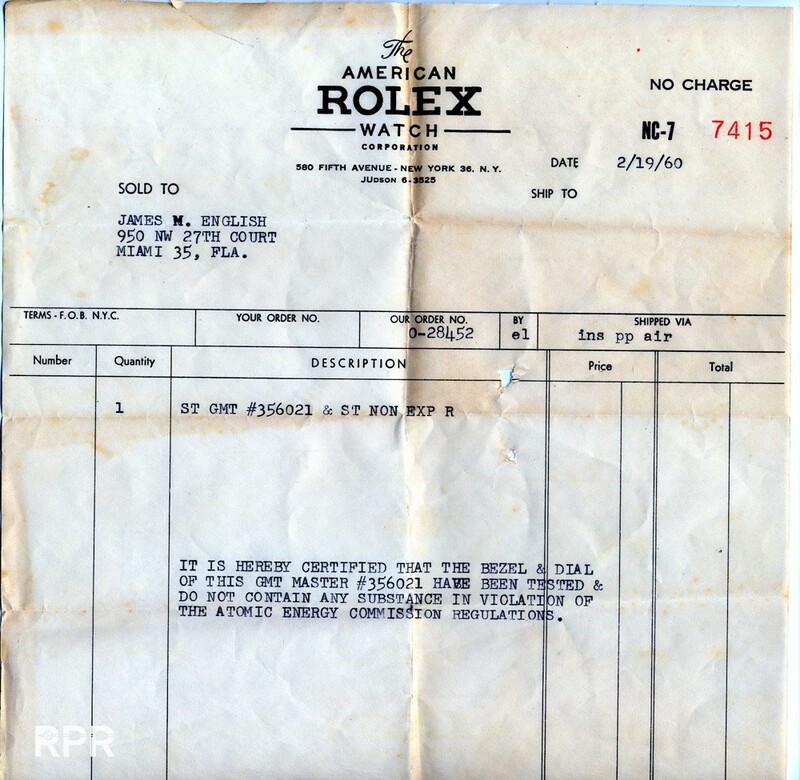 I specifically was always interested to see the rate of a untouched original owners Rolex as with them we knew nothing has been done to chance the look / originality. 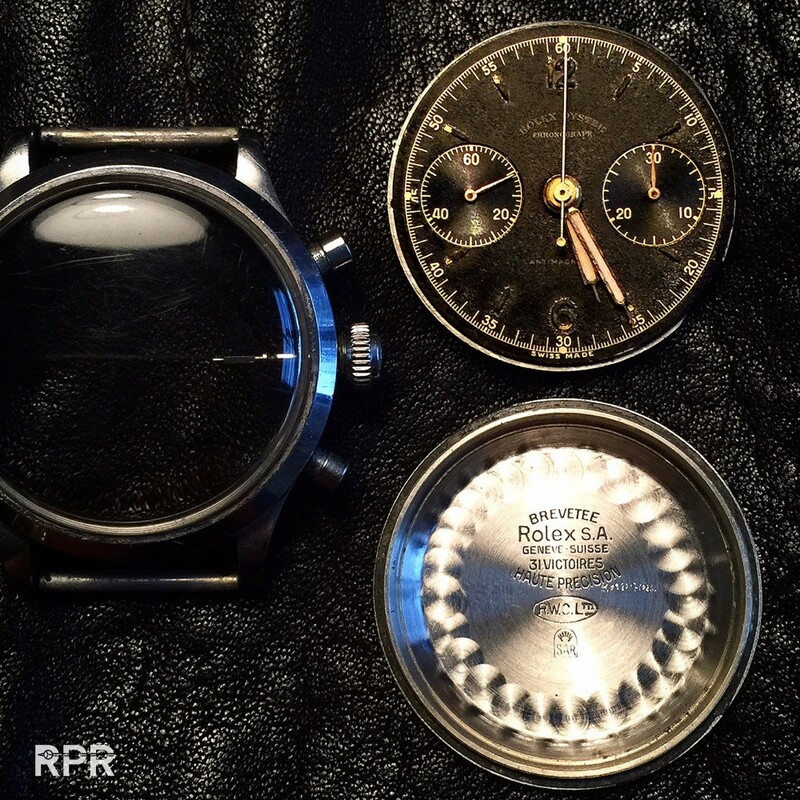 Below a early Panerai Radiomir ref 3646, below measurements from the back..
And up front it’s much higher. 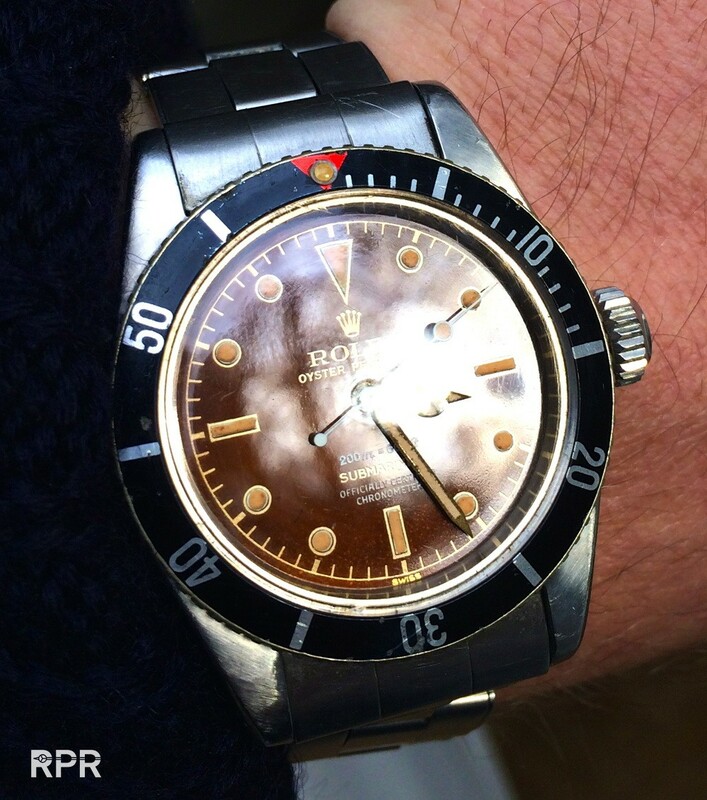 This ref 3646 is still in original untouched condition with it’s original crackle crystal..
A Rolex ref 6542 up front, untouched 1958 example with bakelite radium bezel.. 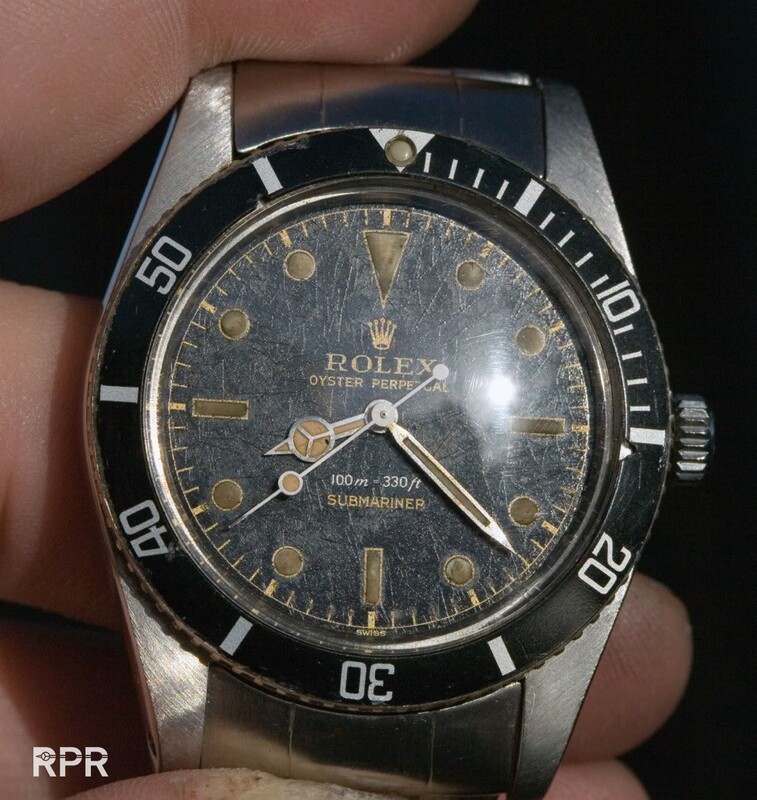 The geiger went really crazy on the early Panerai tools, below a high reading on a compass..
605 x Rolex GMT Masters Ref 6542’s where recalled in the US after regulation found out that the bezel was way to radioactive as you can read below…. 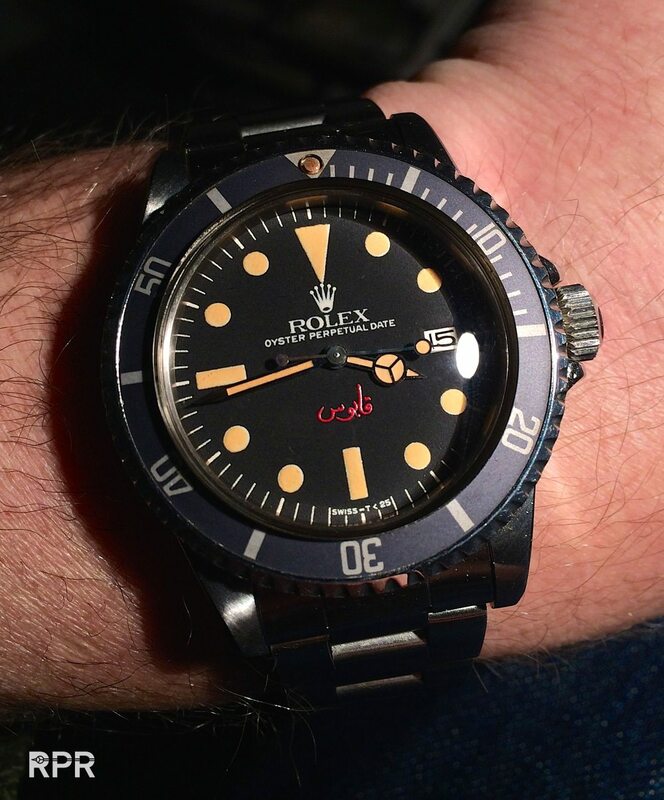 Above a close up of the bakelite GMT bezel and below the GMT Master 6542 of legendary explorer next to Jacques Piccard Deepest dive, Lt. Don Walsh..
You see the bezel lights up, there where the dial is not reacting to the ultra violet light. 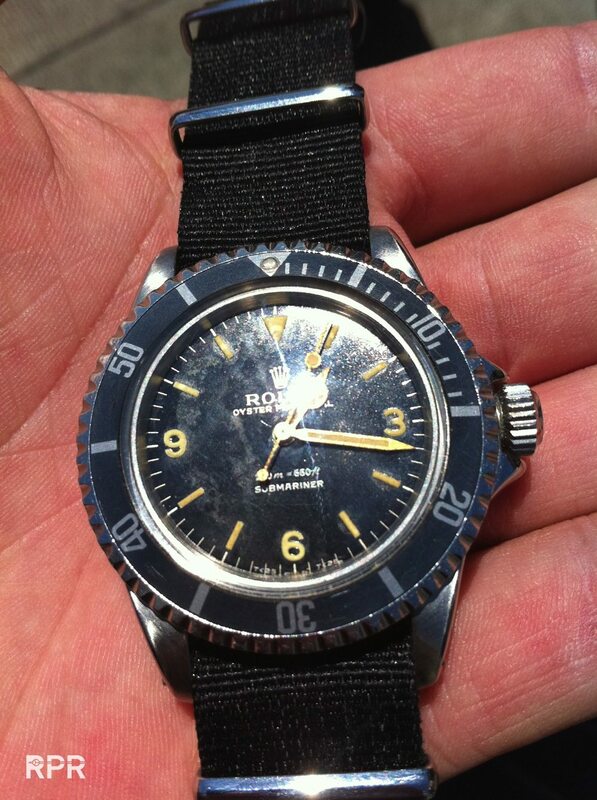 Meaning the bezel is radium and the dial has been relumed with non radioactive material… Front radiation of a Big Crown 6538 and below the bright lightning 6 o’clock marker of a 5508 small crown under ultra violet light. 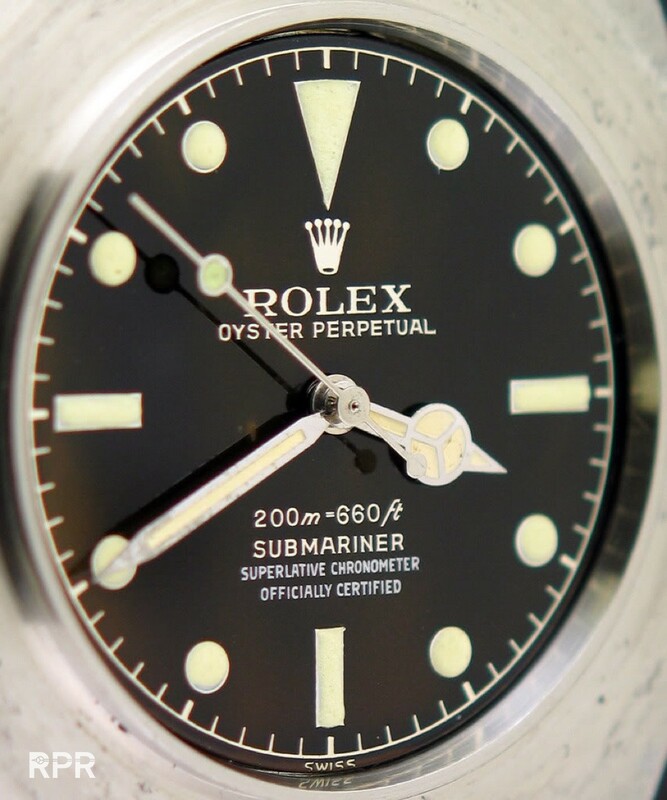 The bright 6 o’clock marker was most probably done by Rolex designers to help divers read the dial in the dark quickly and clearly. 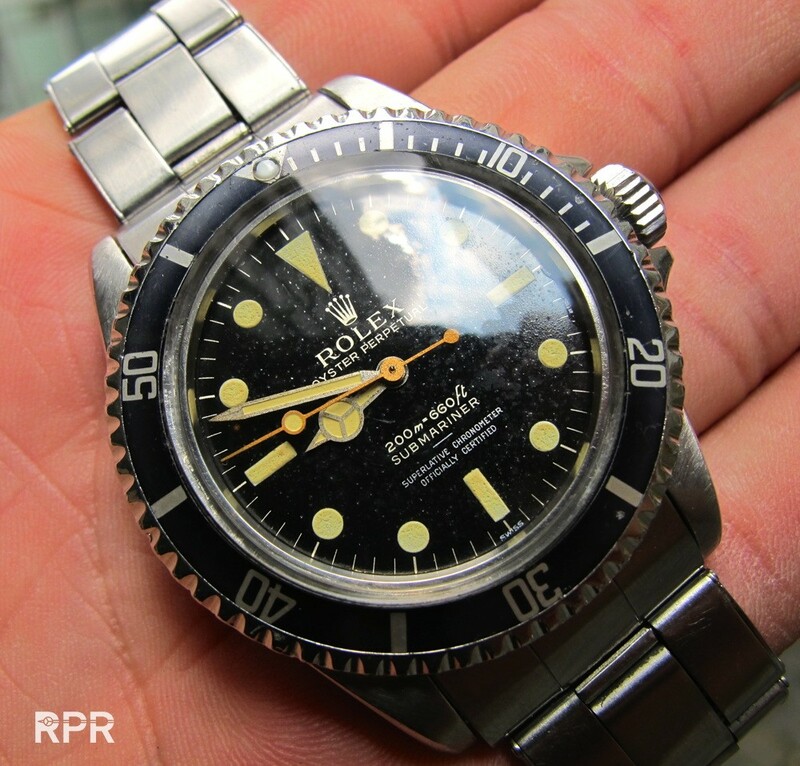 The luminous dot that was added on the bezel and used for timing the dive is not logically always on the 12 o’clock spot so to help the visuality Rolex chanced the luminous of the 6 o’clock marker to a more greenish mixture is my consensus. 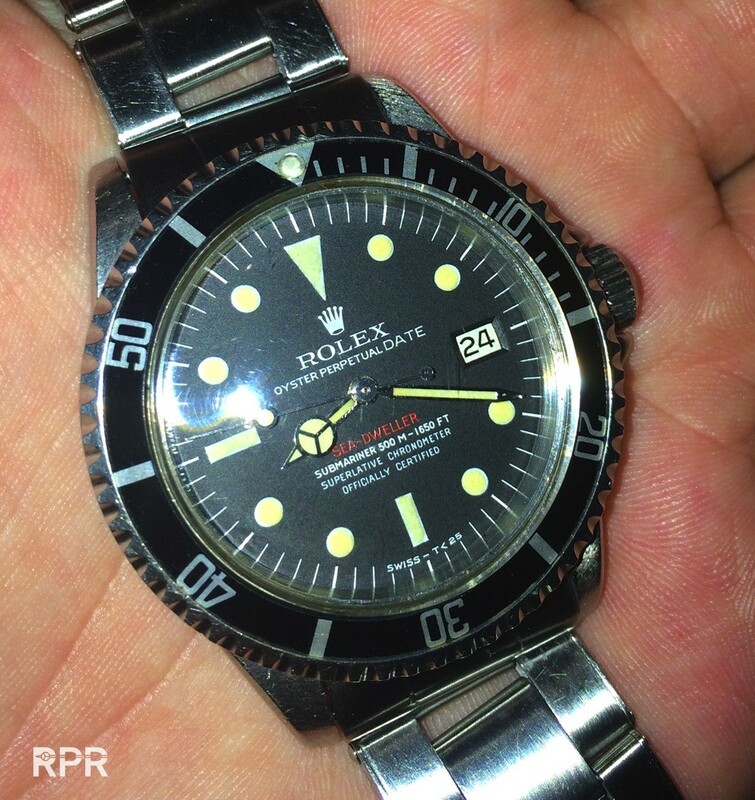 Below you see a early Submariner which has been resumed with luminous. 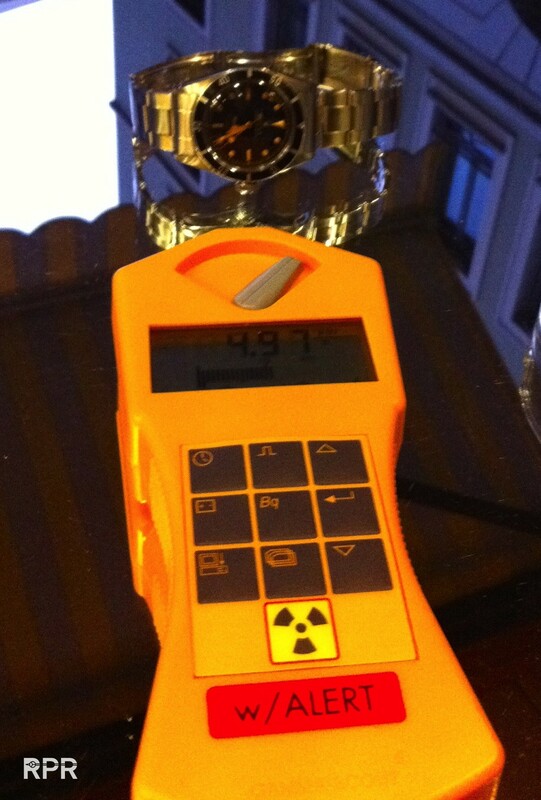 Not always will the Geiger meter give you 100 % proof as nowadays specialist are using old radium to relume a dial. 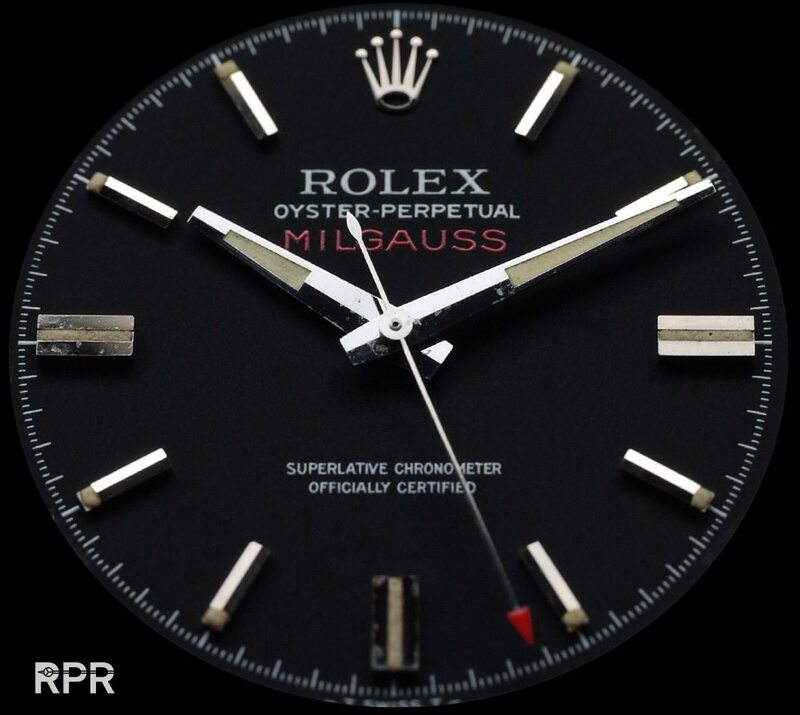 But if you look closely you will see that the luminous is not perfectly added within the round plots, clearly not a Rolex job. 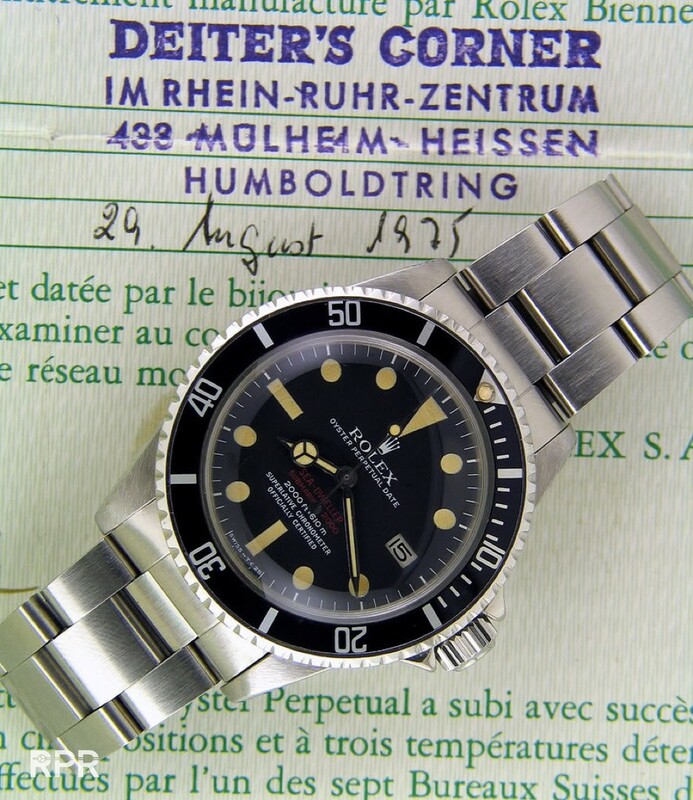 Geiger alert on first generation Submariner… Big Crown 6538 forms second generation, produced in 1958 with glossy gilt dial and radium luminous… Original condition of a rare 369 Submariner version when it was discovered. 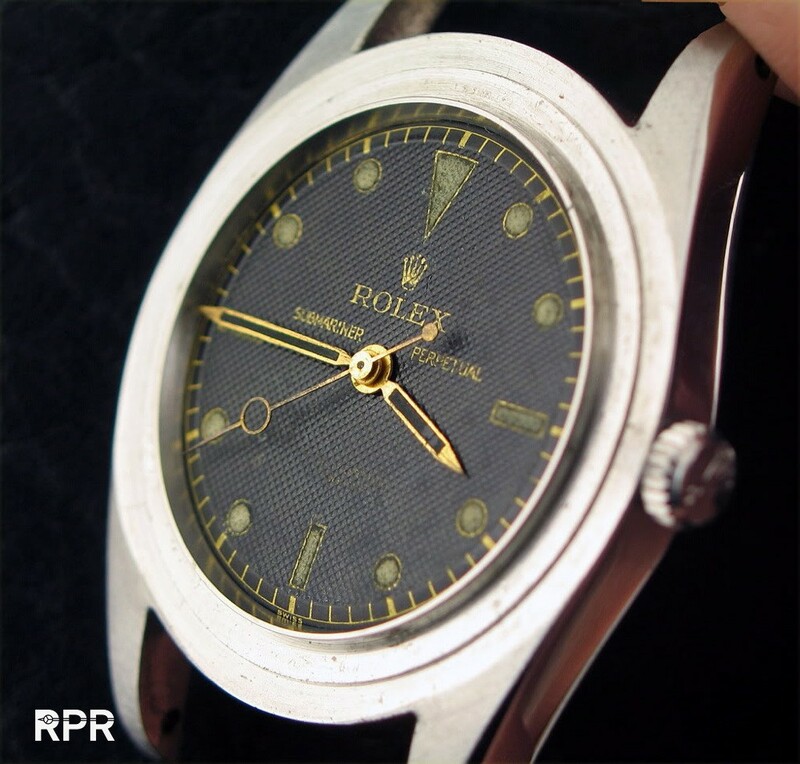 You see the stains of oxidation on the surface, something that can easily be cleaned.. Radium swiss Rolex ref 6234 with original luminous. 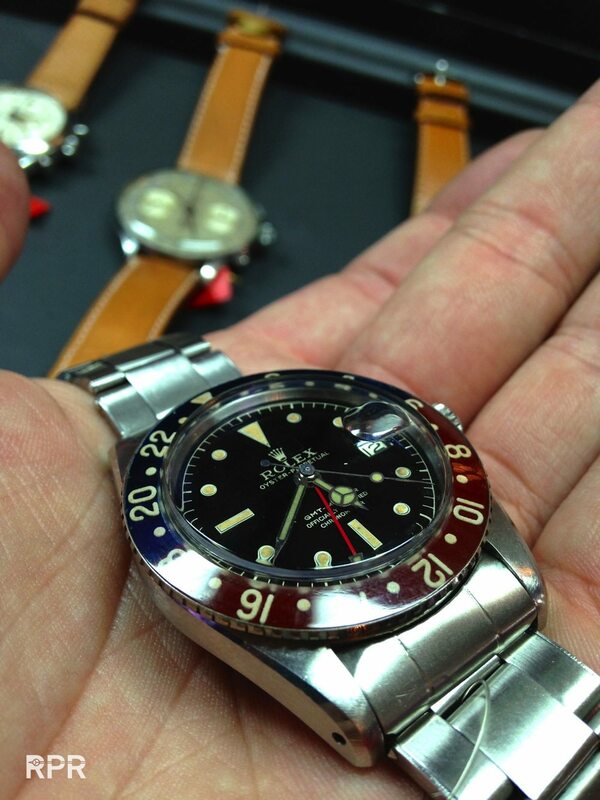 All plots are perfectly shaped and color on the dial is matching the luminous of the hands, first owner find.. 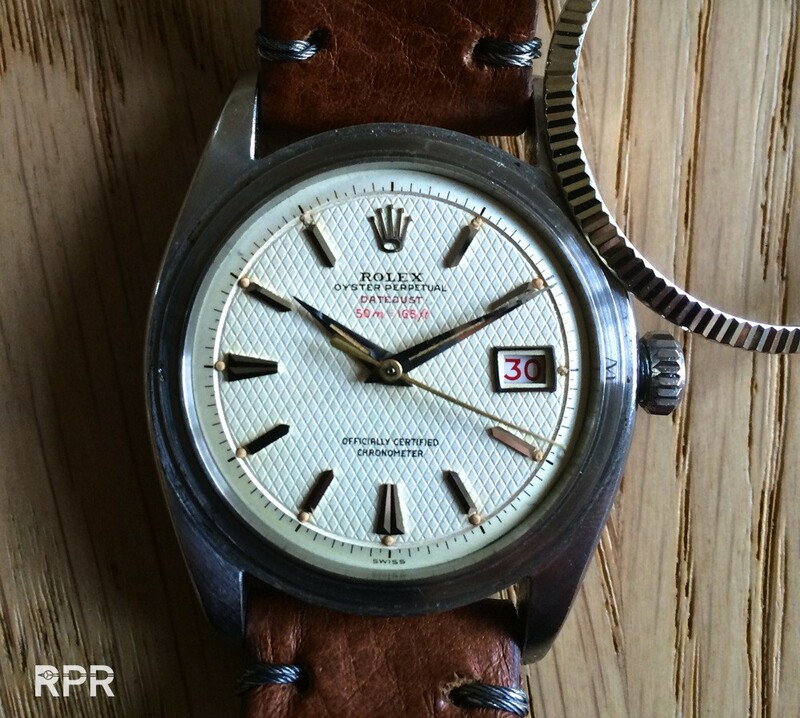 The same we see in following examples, a rare waffle diales Datejust with radium luminous on dial and hands… A second generation Rolex small crown what got serviced early 60-ies but except the bezel insert, still has it’s original dial and gilt hands… A early Big Crown ref 6538 minute track service dial with tritium ( Swiss – T<25 ) Different coronet and print technique.. A 1958 Rolex Small Crown Submariner Ref 5508 with it’s original bezel and spidered tropical dial. 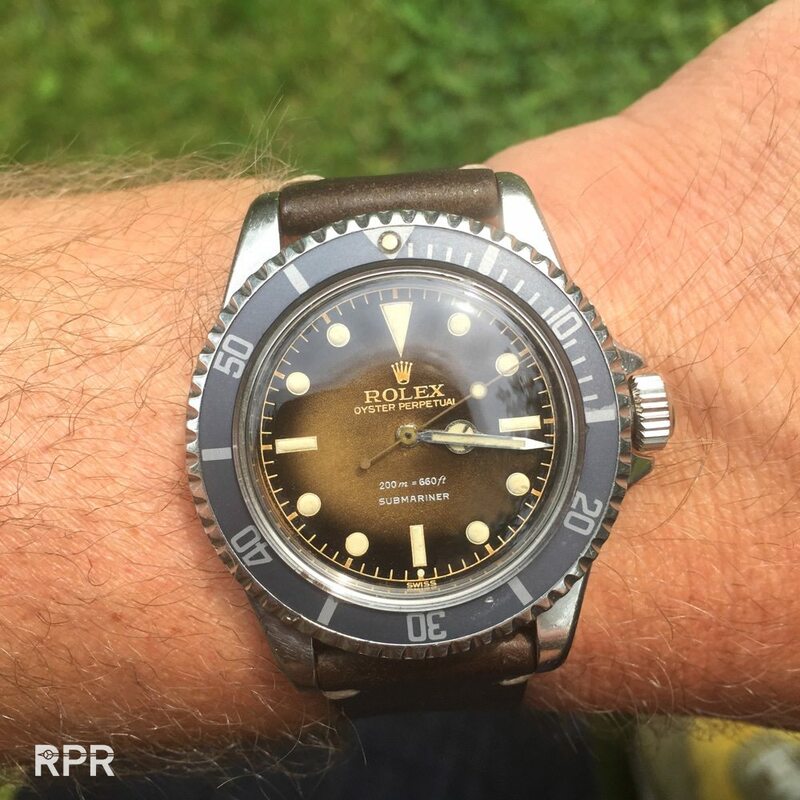 We see the humidity in the hands turned a bit green. 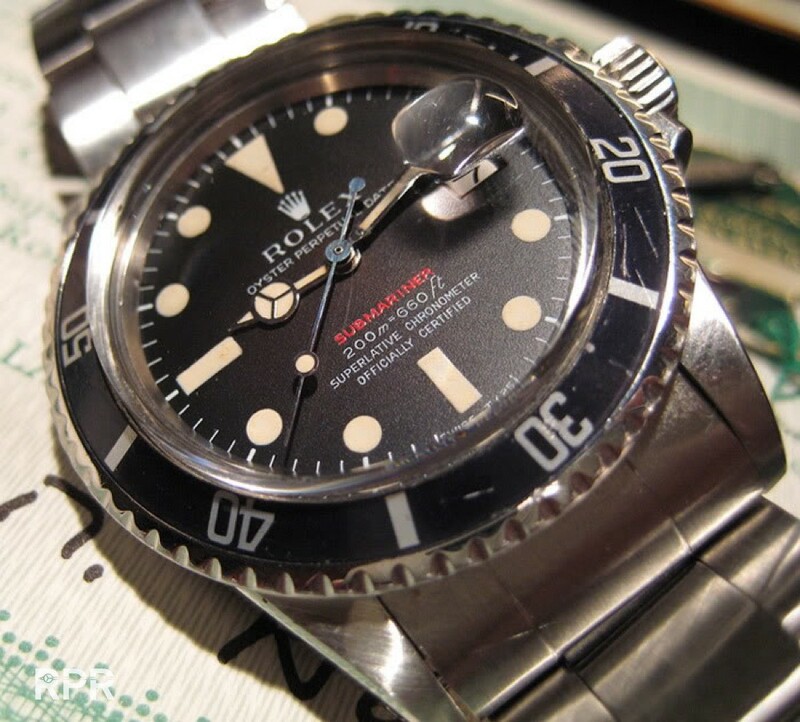 A transitional “Underline” which has been placed between Submariner & SCOC and a “White Swiss” added on top of the track. 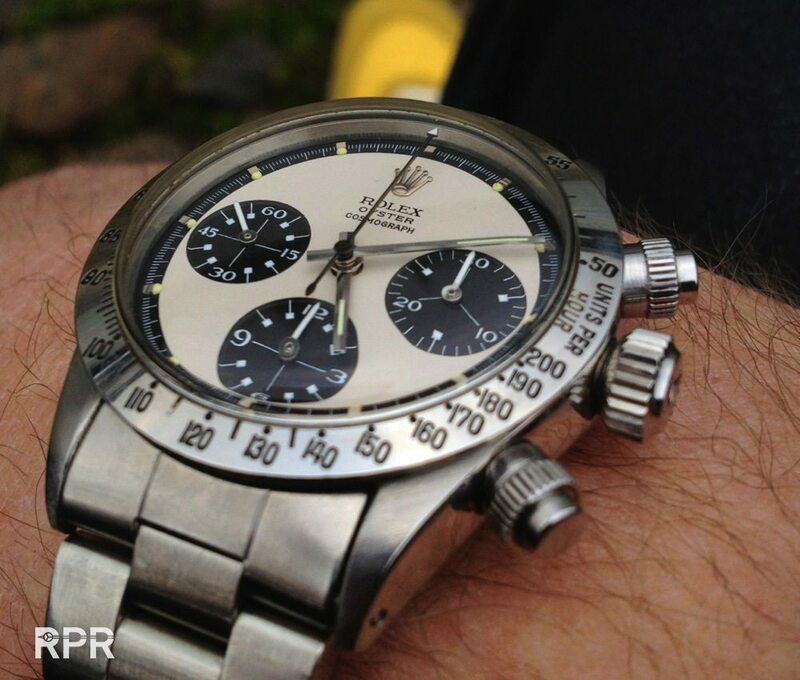 We see that the surface is slightly speckled, something thats more usual then unusual with these transitional dials. 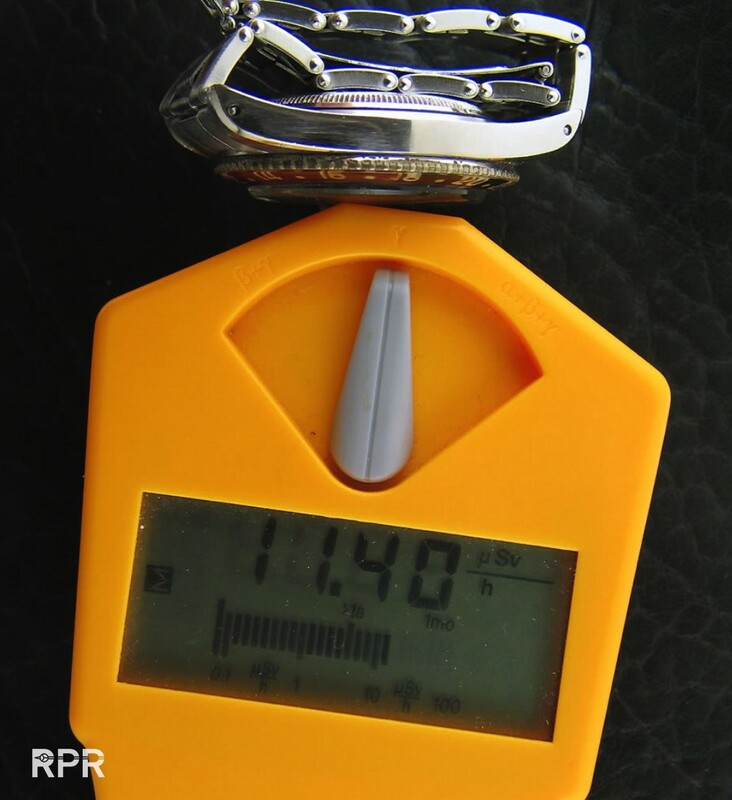 Seems like the quality was not perfect. 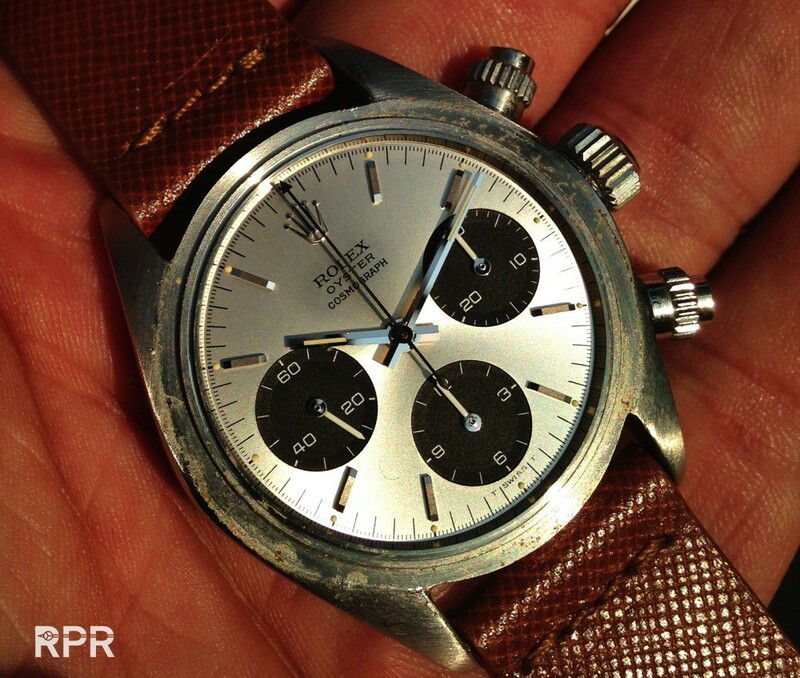 A older dial plate used for a newer case design perhaps? 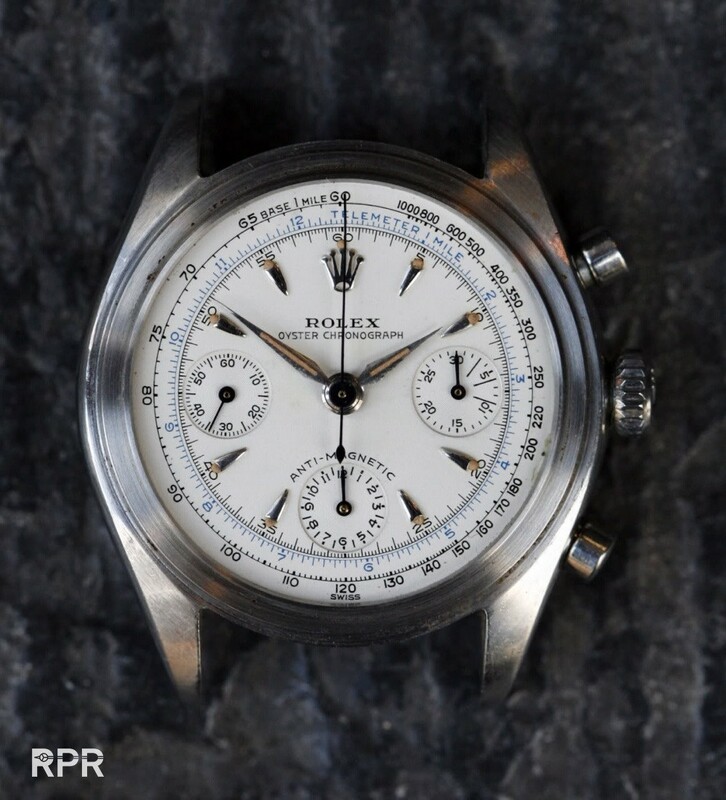 Close up of the “White Swiss” added on top of the track..(follow the link to more vintage Rolex study) Fully gloss Ref 6234 chronograph dial where the “Underline” & “Anti-Magnetic” is added later. 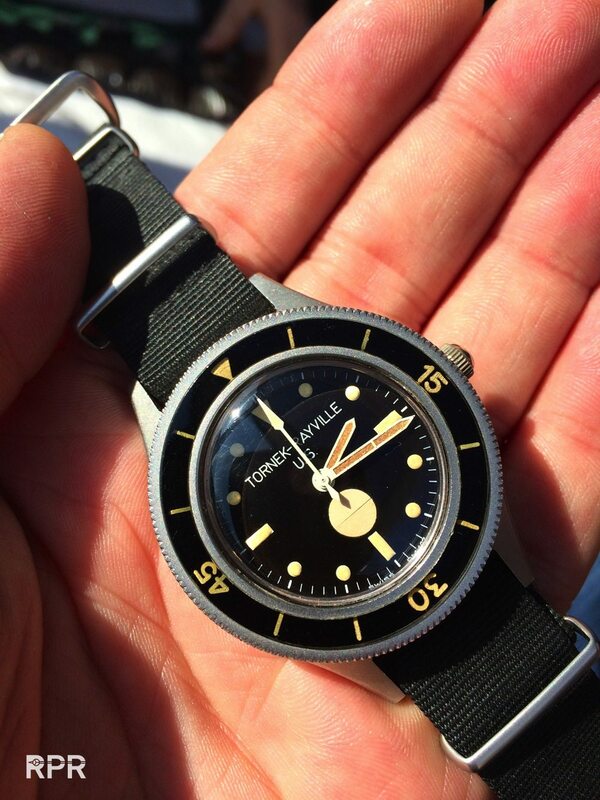 Obviously a old style dial design that got luminated with tritium. 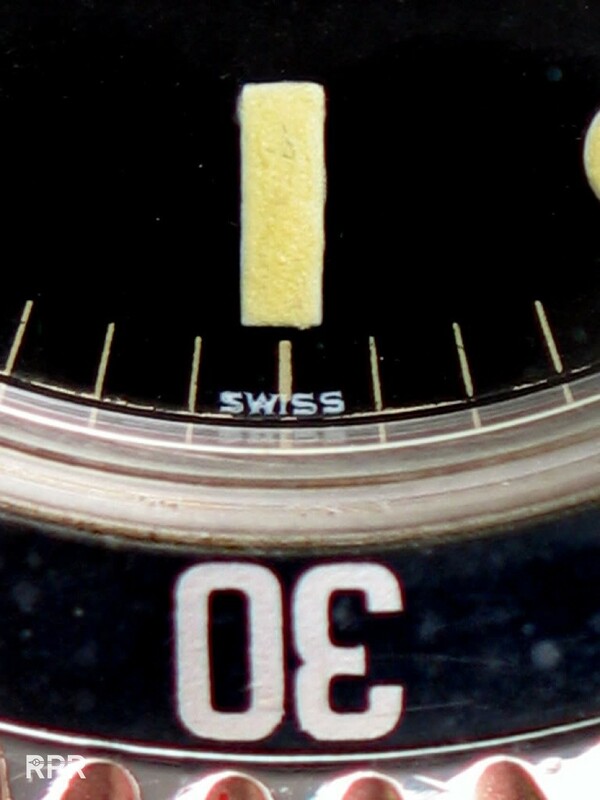 Side view of a 5512 SCOC “Underline dial with a close up of the tritium plots. 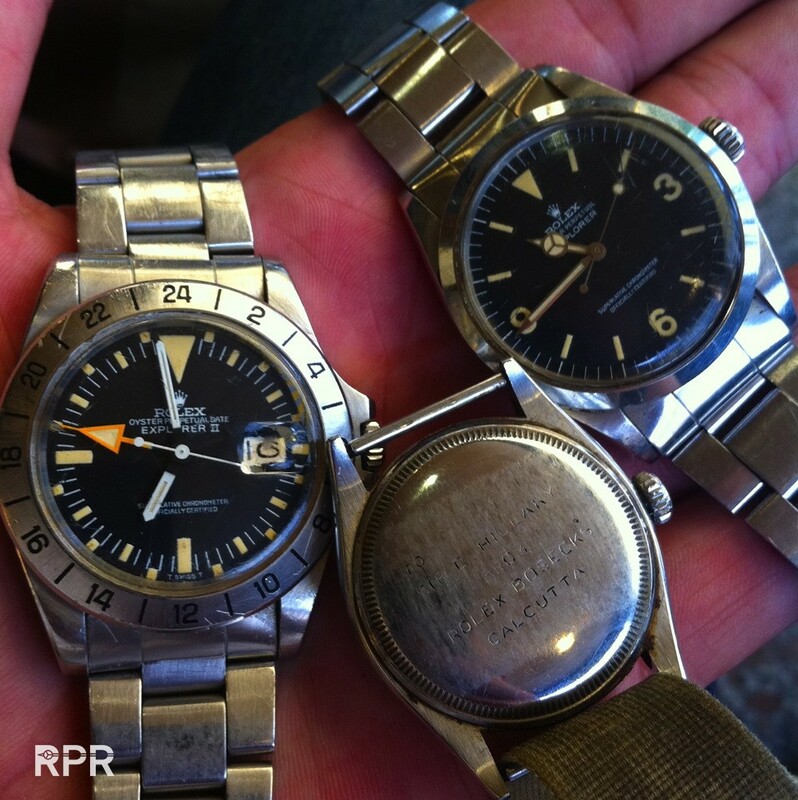 We see they are puffy and also the white disc underneath are partly visible. 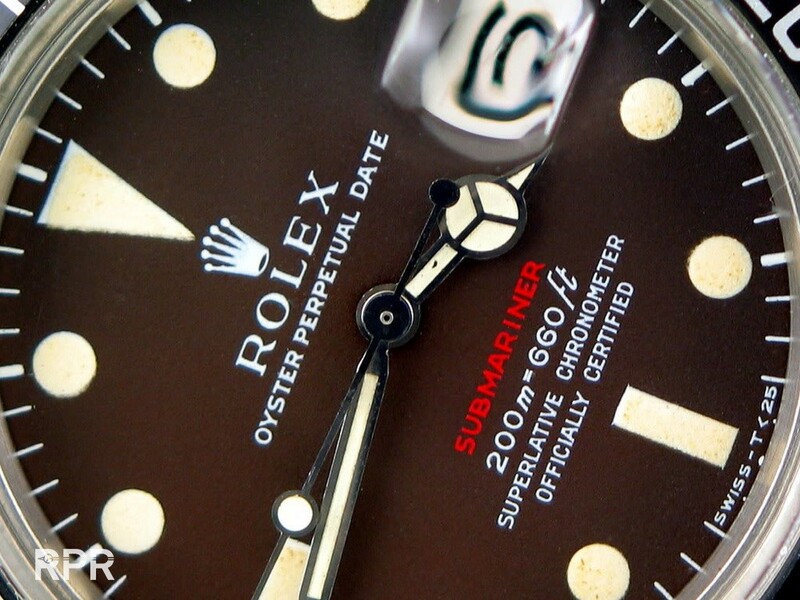 The underline and SCOC text is added later on top of the lacquer, the rest of the print is punched into the dial, laying deeper.. 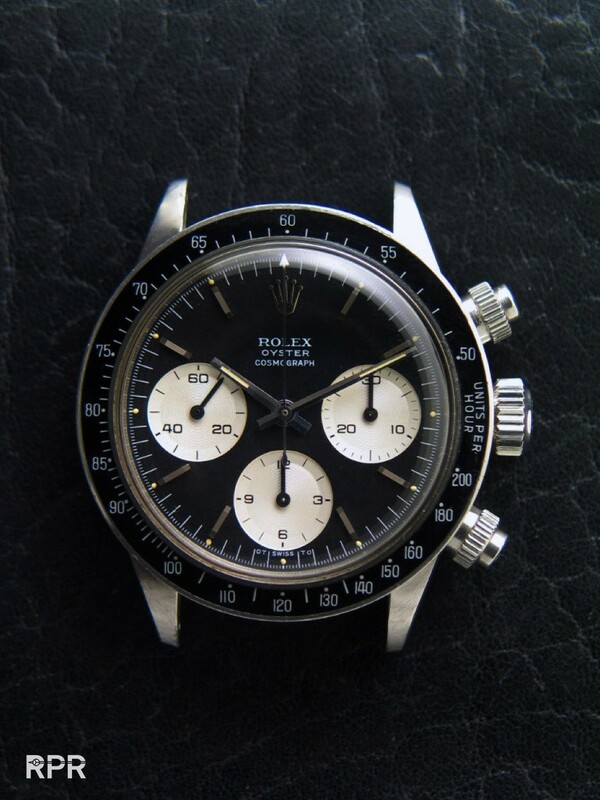 Yet another stunning transitional Sports Rolex, a 5512 minute track with underline, slightly earlier then the above example due to the close track. 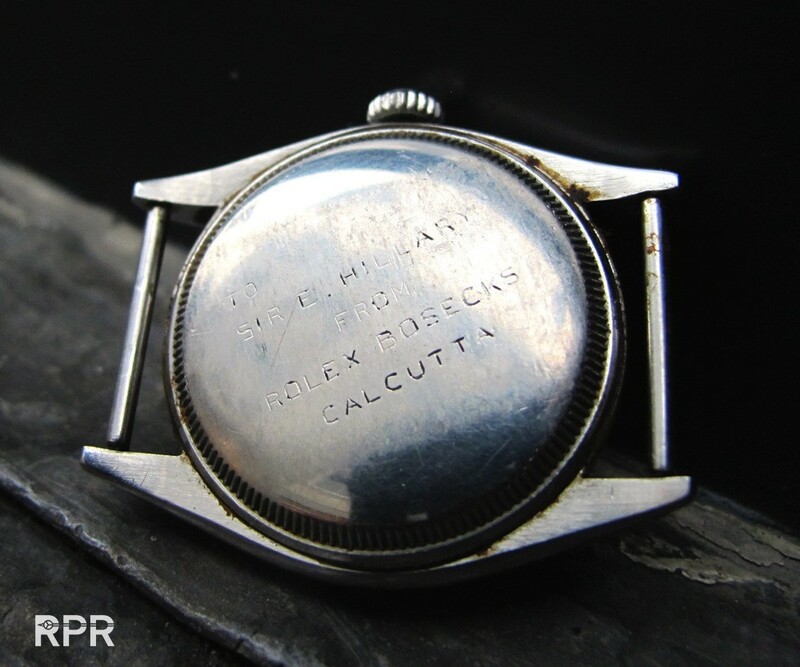 and here another late 4 line Chapter Ring ref 5512 with transitional “Underline”, probably one of the very last minute tracks.. 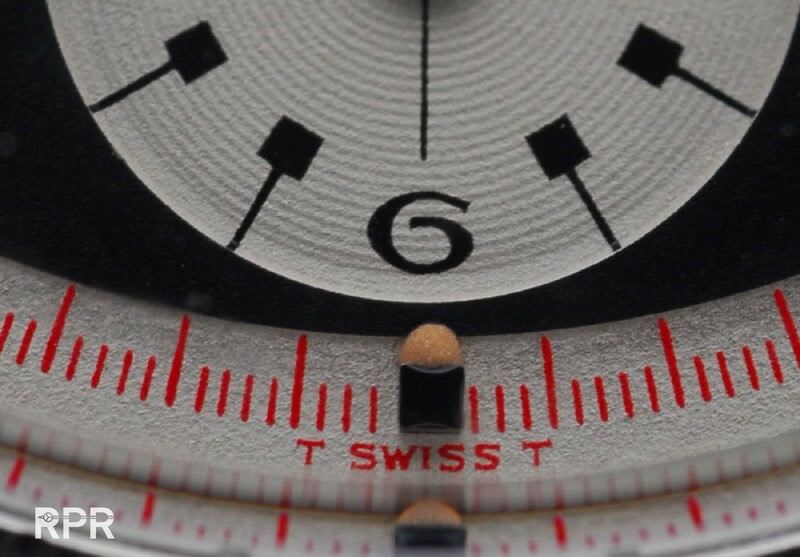 The meaning of T SWISS T and its different versions. 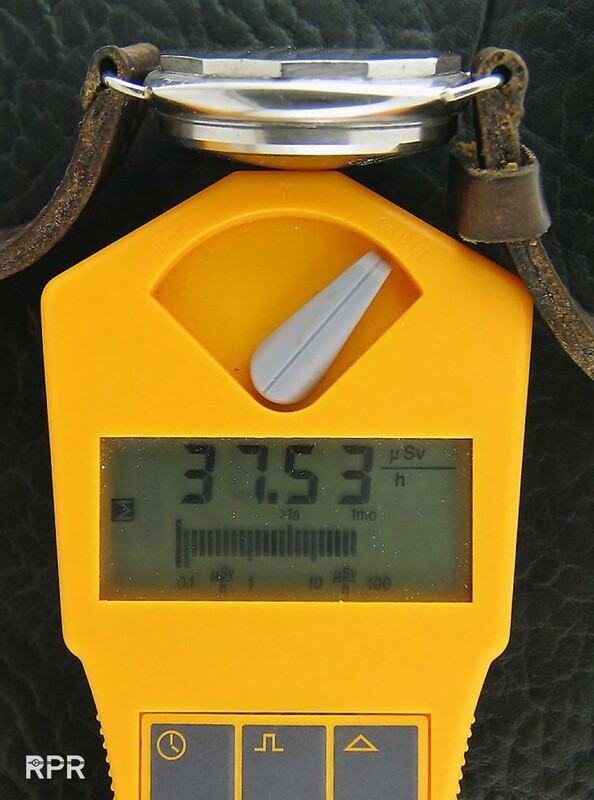 Swiss T < 25 = radiation lower then 25 Milli Curi Ci. 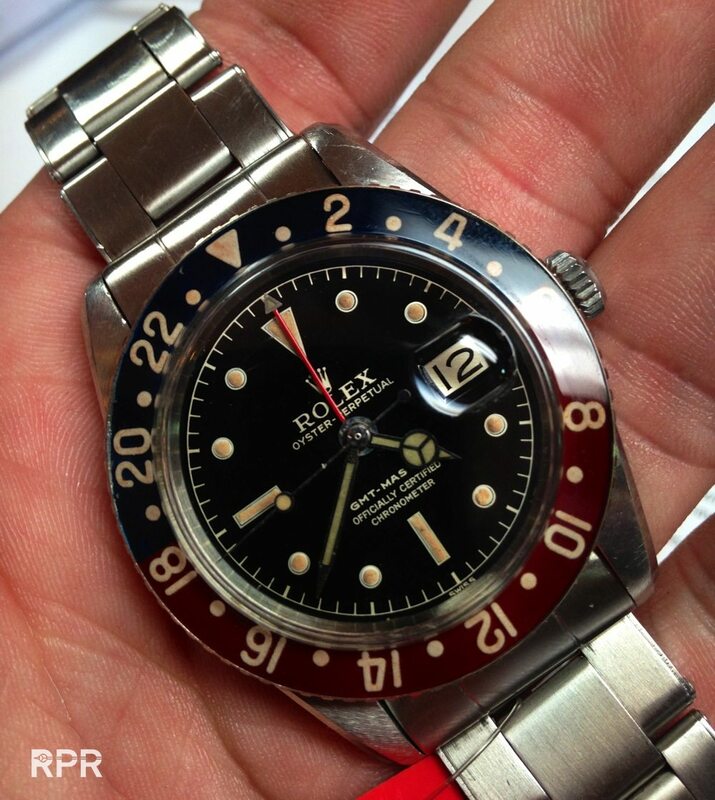 A overnieuw from one of the most successful references Rolex ever made, the Submariner ref 5512/3 from 1959 till mid 80-ies..
A “T Swiss T” Daytona ( having 1/3 of the tritium as a more luminated Submariner or GMT ) Nicely aged dots are matching the color of the hands. 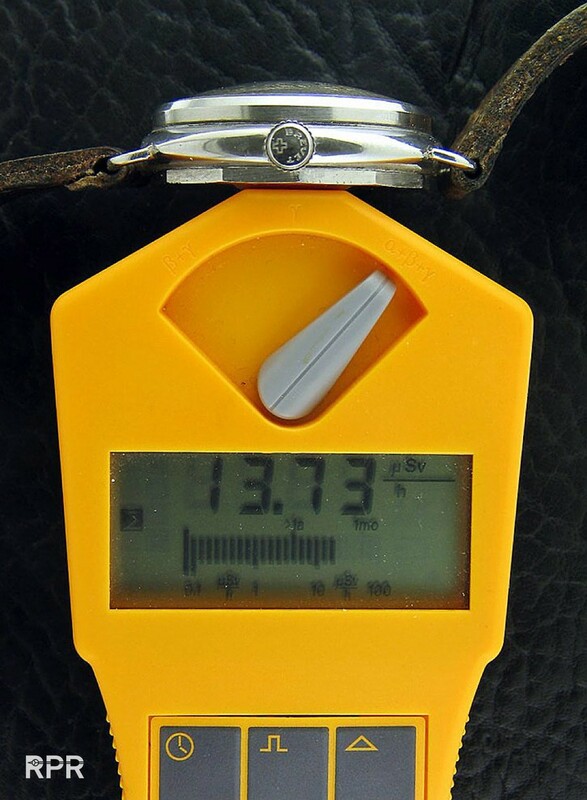 Here we see the tritium light up under ultra violet light, shortly after you did this, the bright color will fade away and stay visible in the dark for another minute or 2. 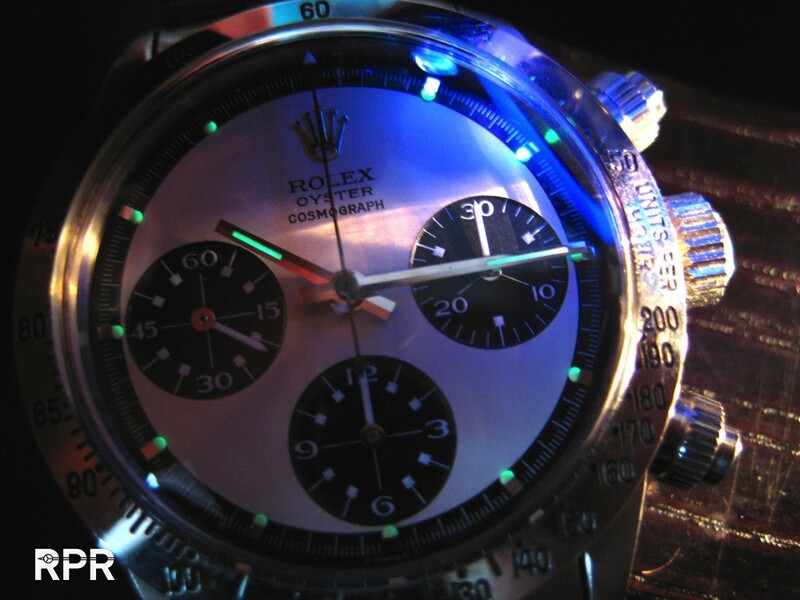 In daylight we see the luminous is creamy colored, once activated with UV light it become bright green. 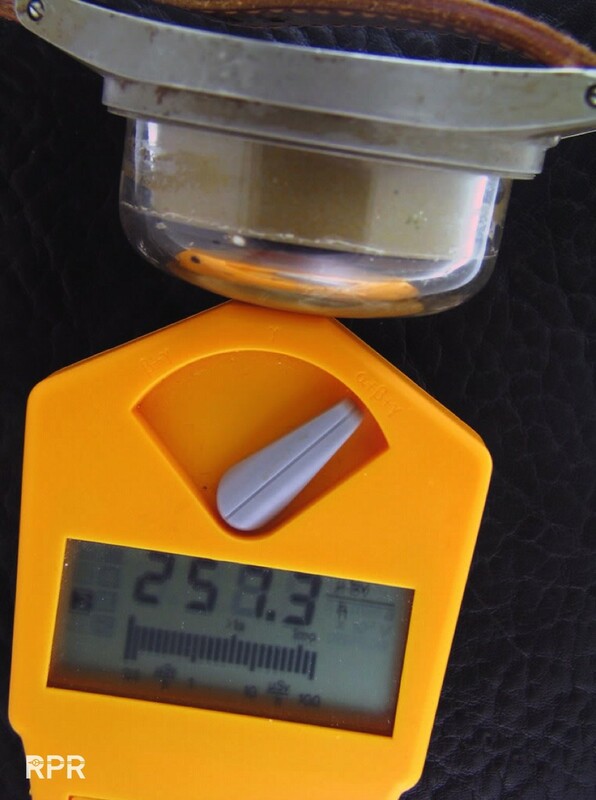 Up close a detail of the structure of how a original aged tritium dots looks like, spongy. 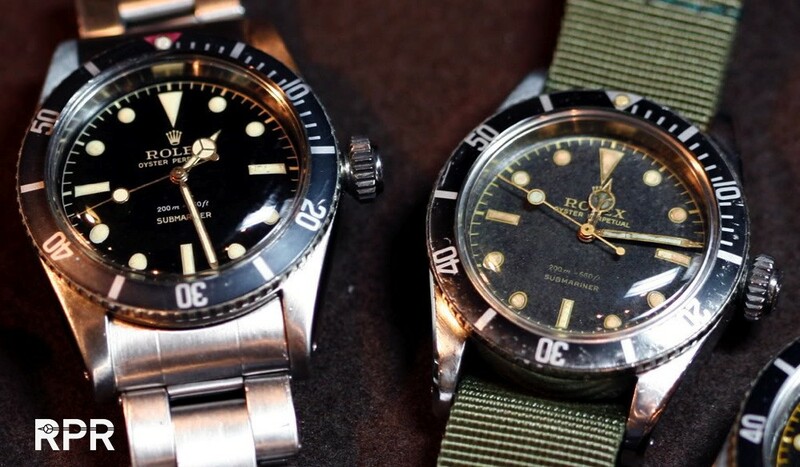 2 nicely aged unrestored Cosmograph’s with perfect matching tritium luminous..
We see that sometimes the lume dot has been moved, most probably due to a hard hit like falling on the ground or so..
Around the beginning of the 70-ies we see on several Sports Rolex that the black paint of the dial changed during the years to a tropical brown tone. 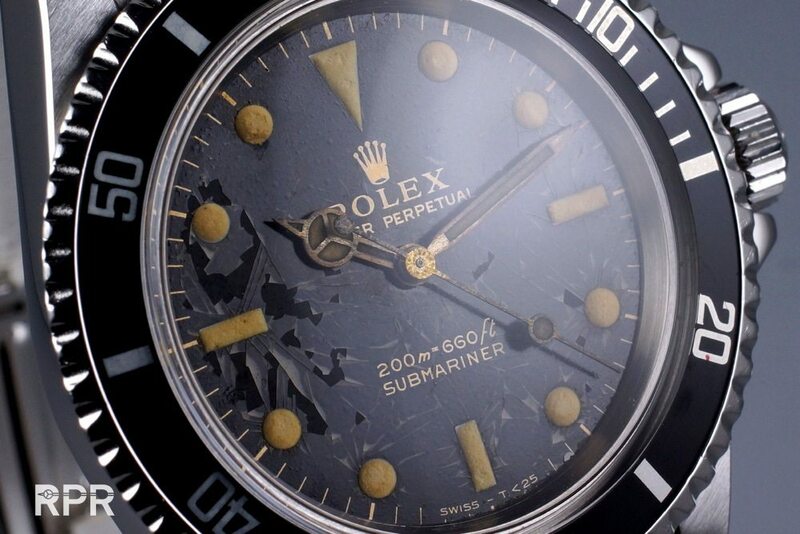 This was most probably due to the fact that the dial maker mixed his black color with plenty of red pigment and due to the exposure to the UV light, the black faded to brown. 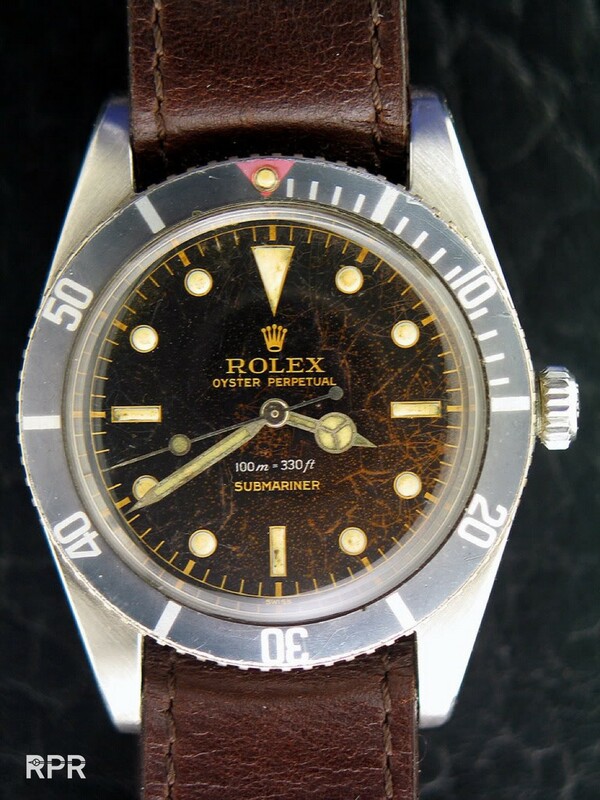 Something we particularly see on Meter first Red Sub’s, MK2 Seadweller’s and GMT Masters but also on regular 5513 Subs or Daytona’s from around 1968-1972. 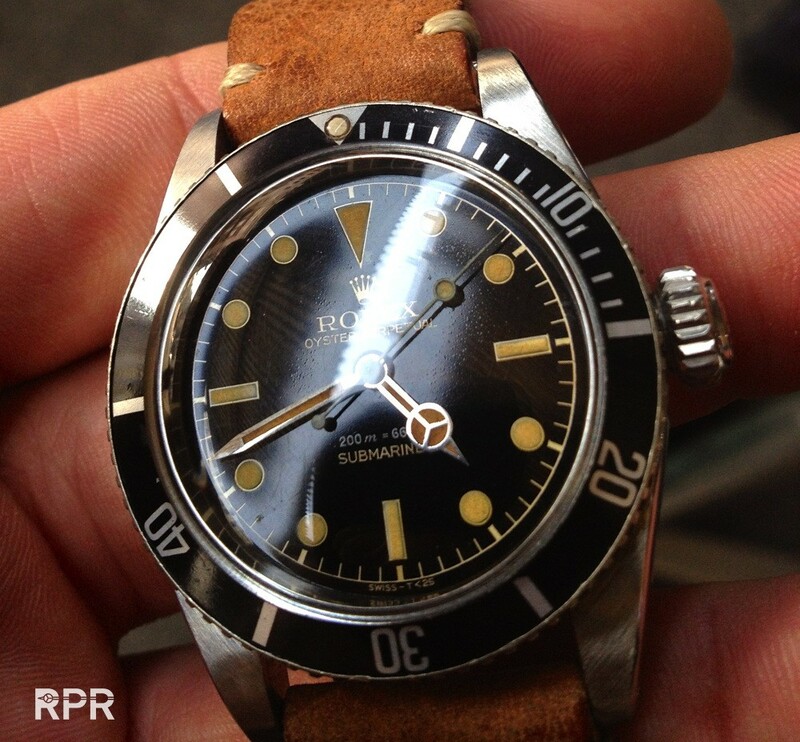 A MK2 thin case Double Red Seadweller with tropical dial. 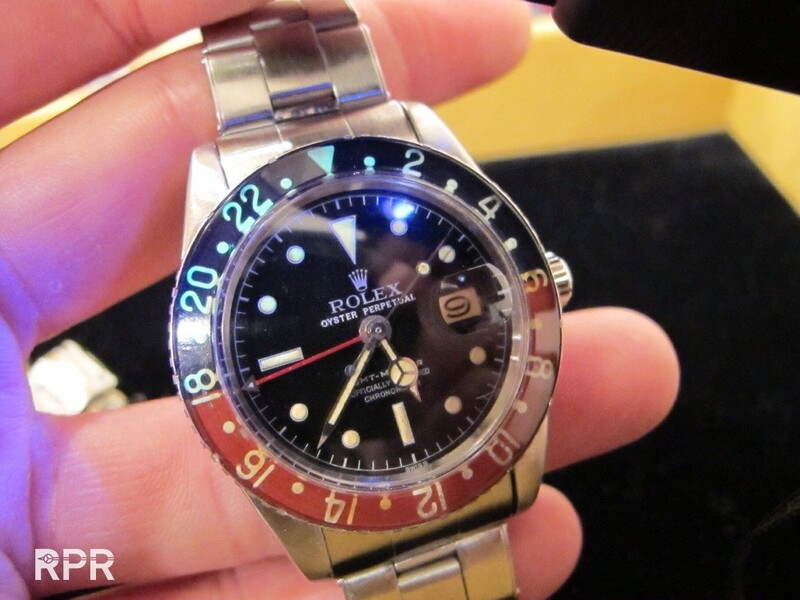 The red and white paint is as usual with matte dials added on top of the dial, without any lacquer over it. 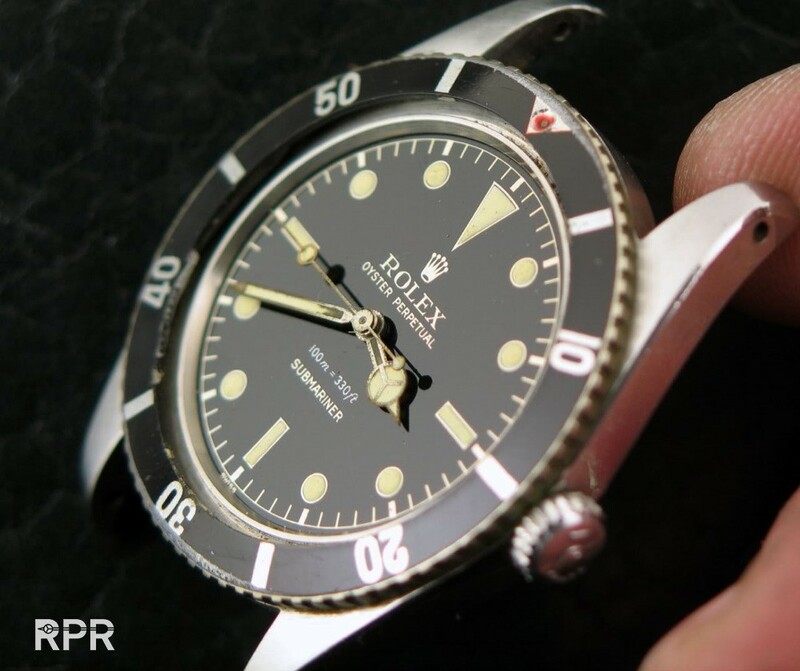 On single and double Red Rolex dials we often see that the tritium luminous is very thin, sometimes even more white then creamy colored. 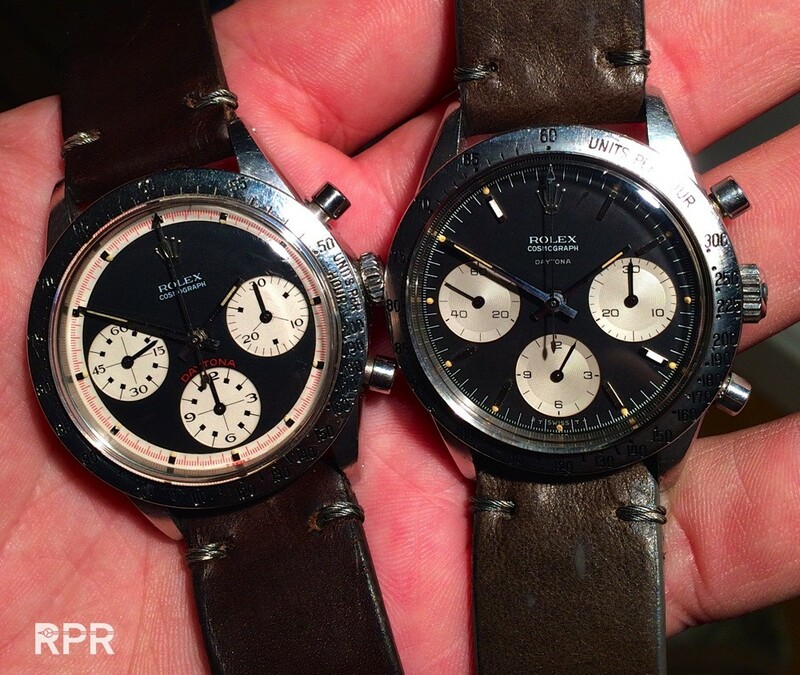 A Sigma ( white gold markers around 1970) T swiss T Daytona with faded tritium dots and tropical brown sub dials All black sigma Daytona from first owner in untouched original condition. 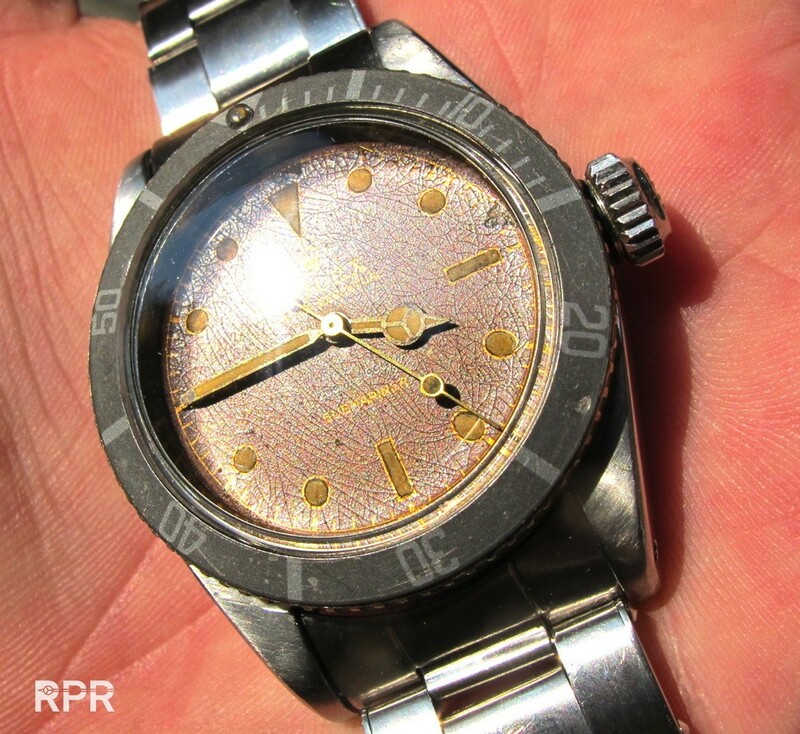 Perfect matching luminous shows a perfect condition of the dial.. 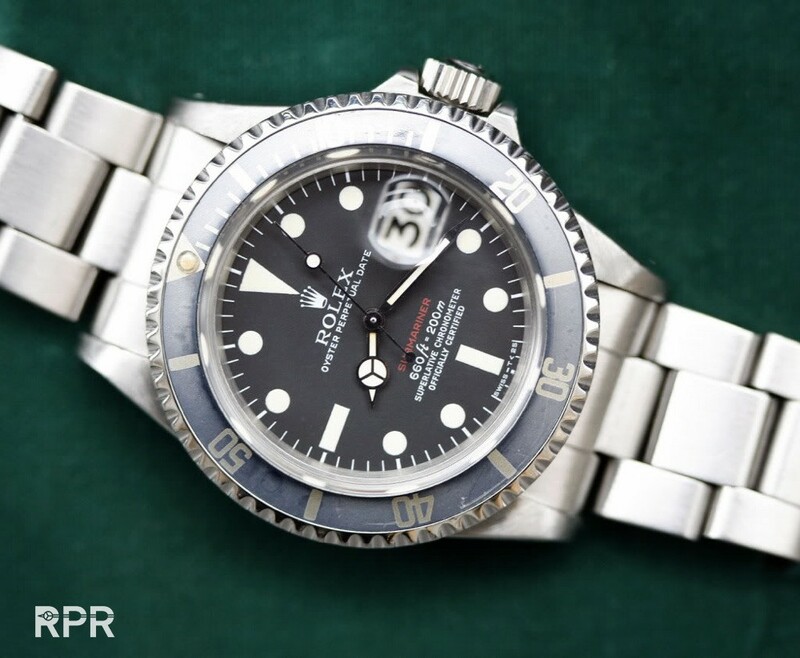 This has been offered for auction by the previous owner, clearly we see the matt dial making it a mixture of wrong decisions. 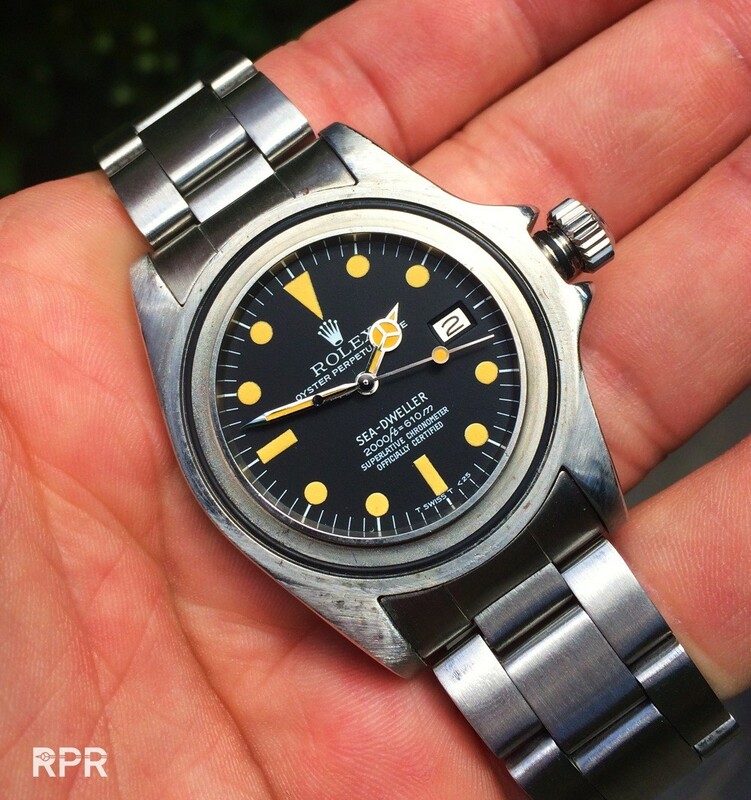 Original 369 Explorer dials where printed in galvanic technique, making the text lay dieper, the surface was glossy, the typo was matching the date of 1962-1965 when these iconic beauties. 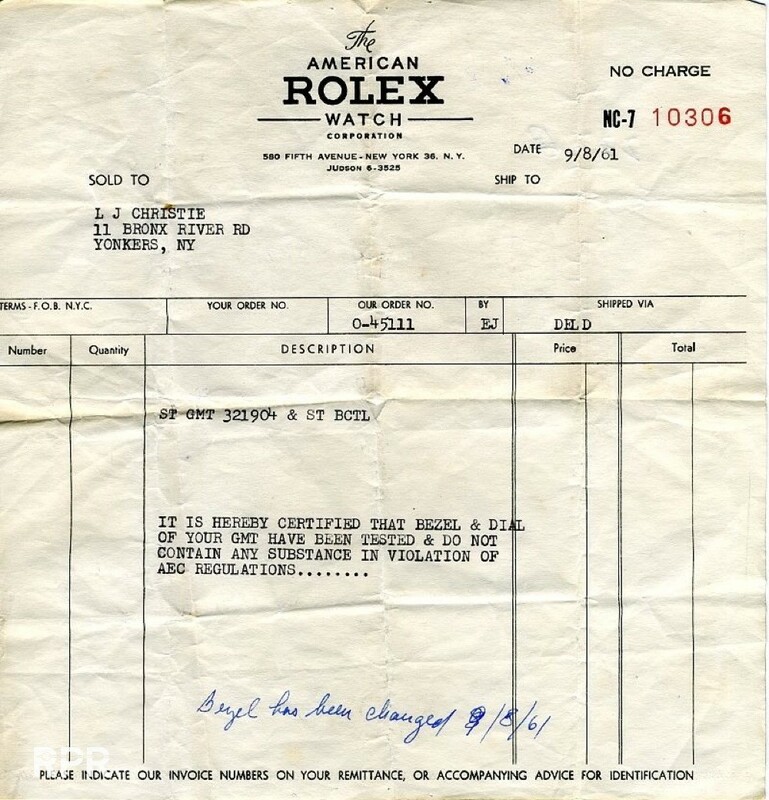 I personally think it’s not ok and I heard they stopped doing this. 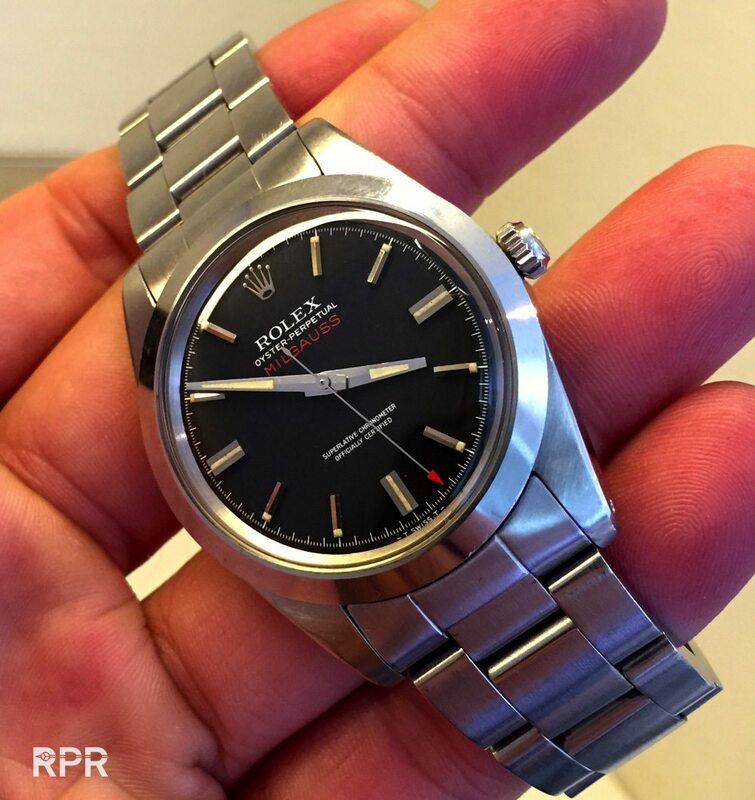 Yet another special Rolex lume we see with the Milgauss ref 1019, there where the dots are normally round, they are square now.. 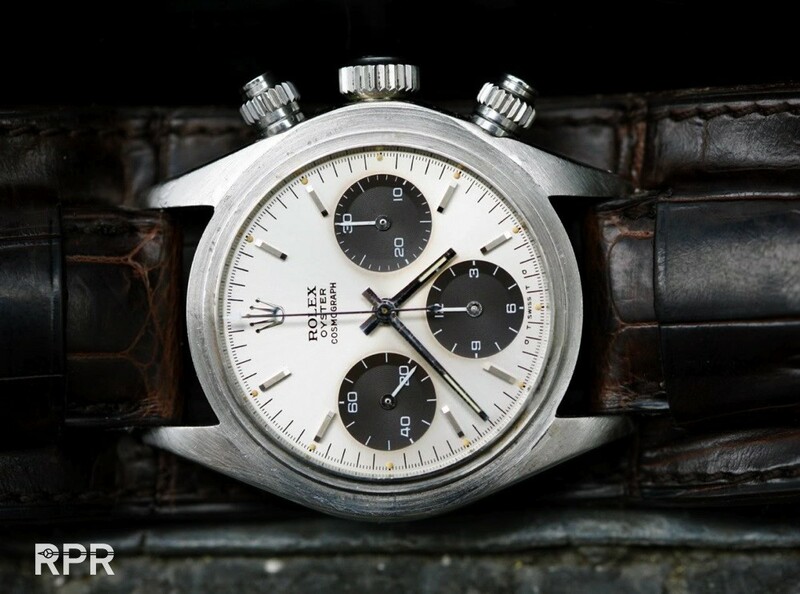 This post was written by Philipp on September 11, 2016.